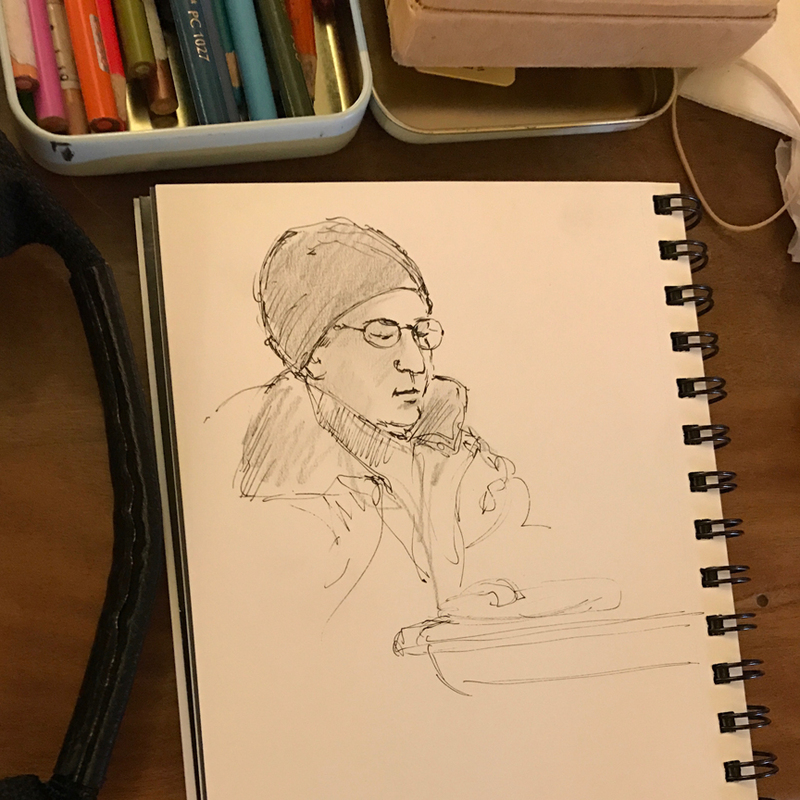 Never at a loss for sketching subjects! 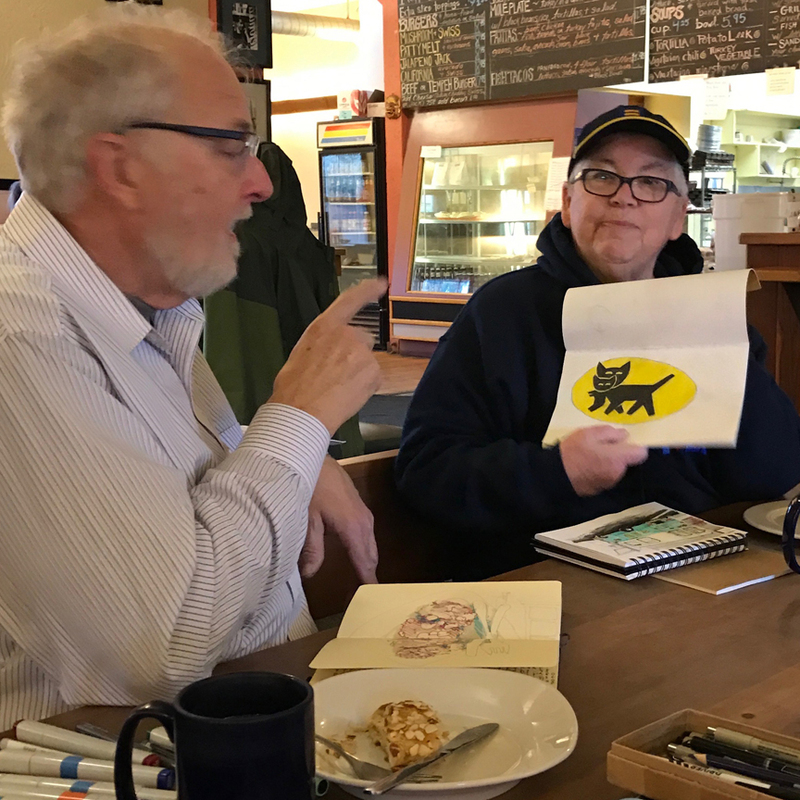 Hugh and Ken don’t let coffee consumption interfere. 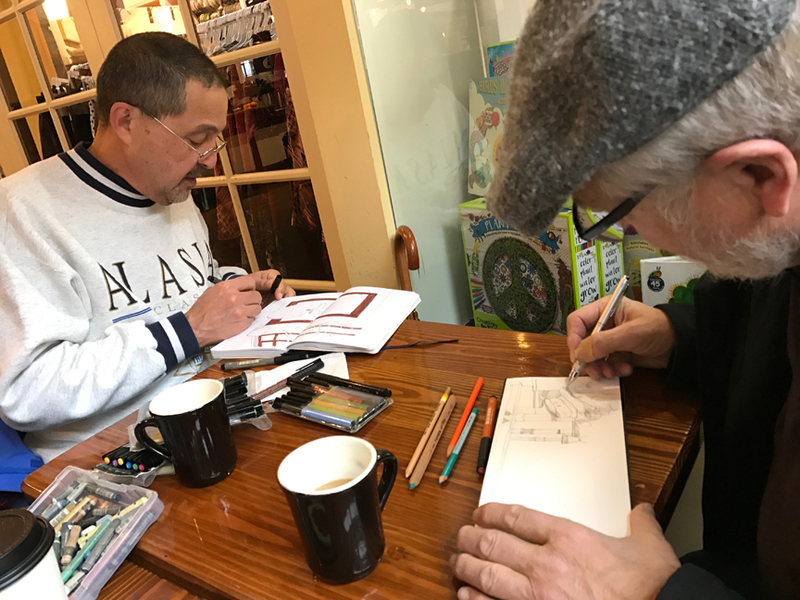 Go guys! 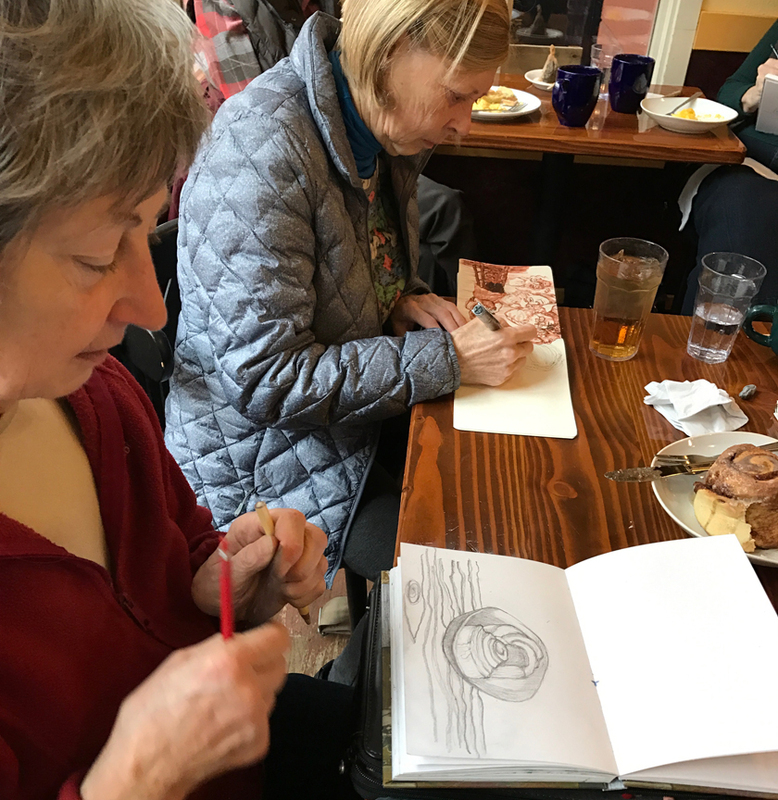 Heidi and Jane both sketched the fabulous cinnamon rolls, prior to deconstruction, and Barb Sh starts a new page in her sketchbook. 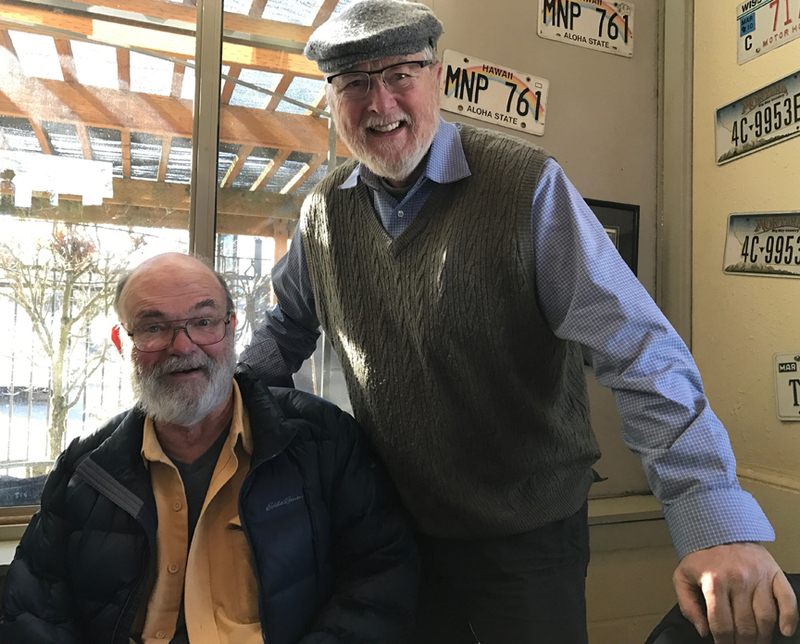 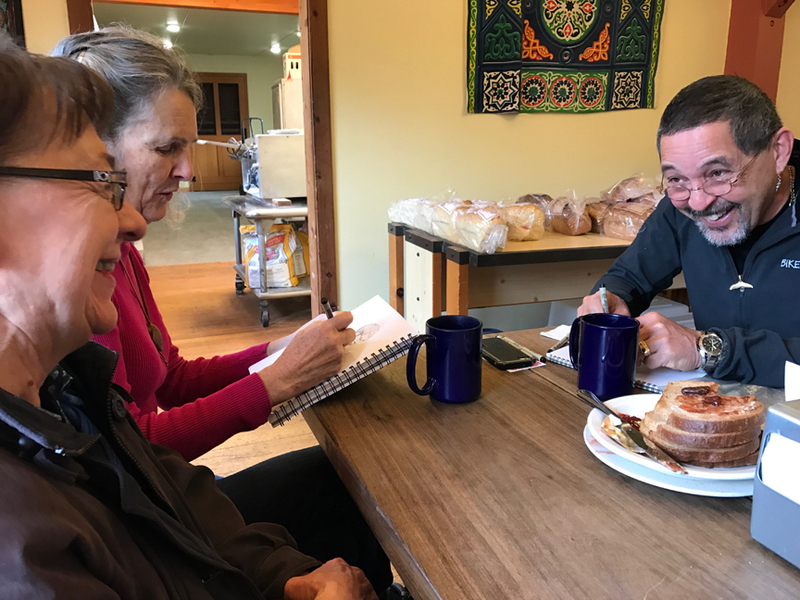 Erik works on a wooded scene, while Barb So chats about the scene out the window – good advice is always available at our meetings. 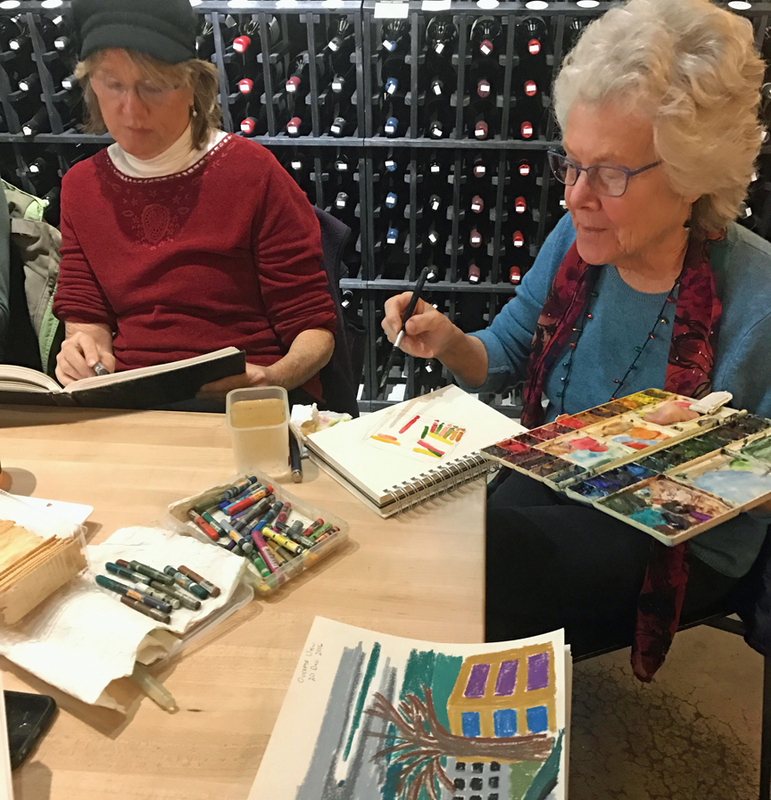 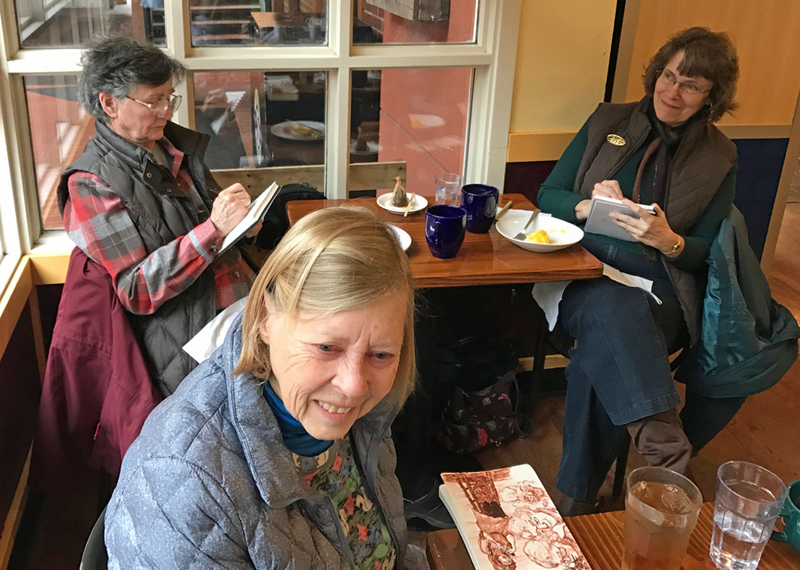 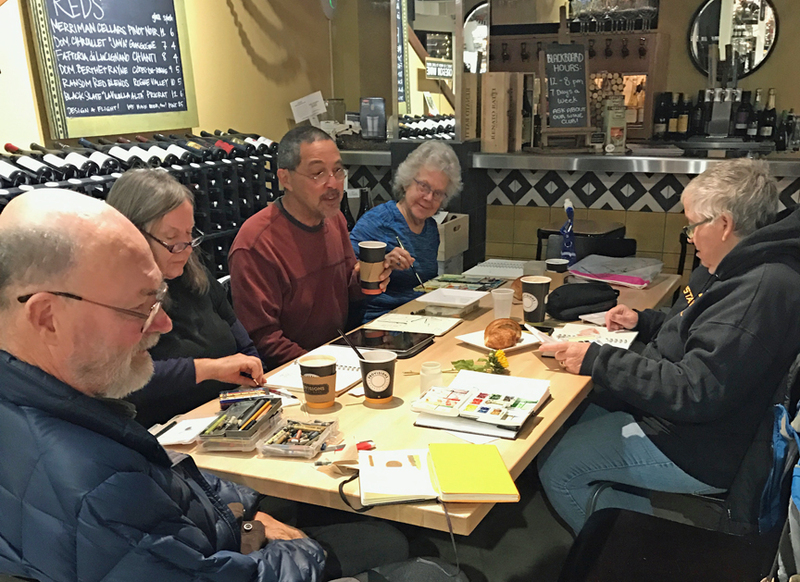 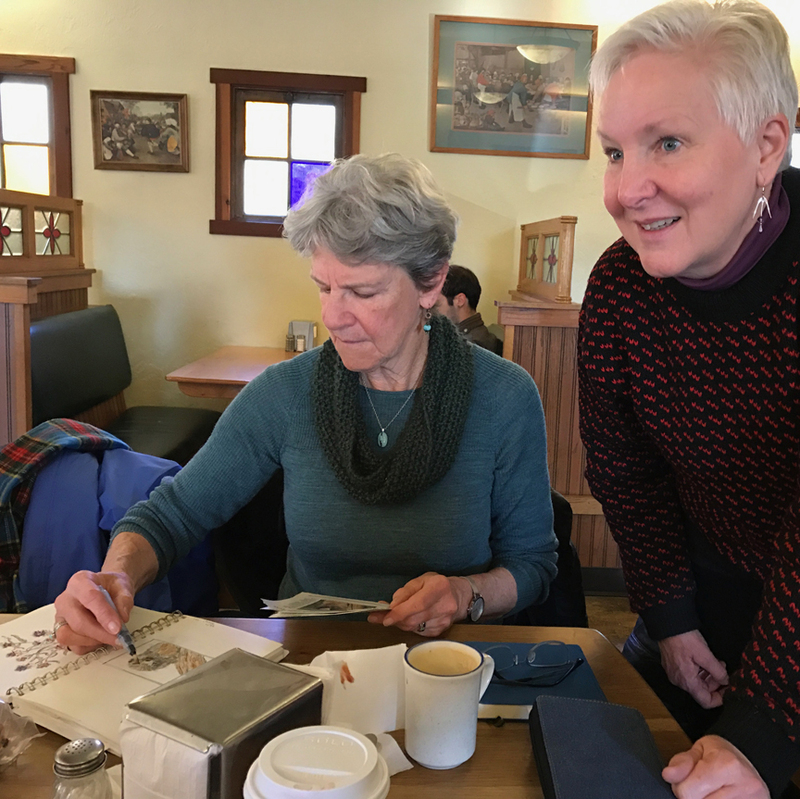 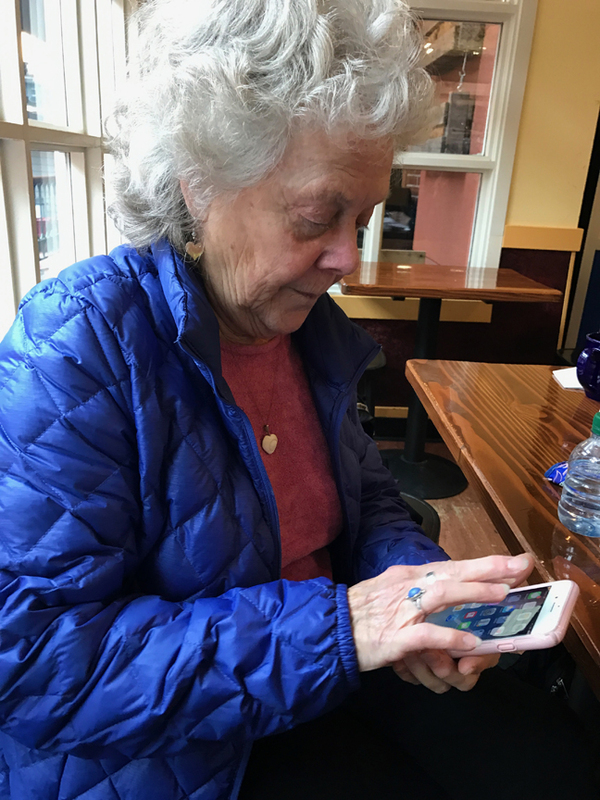 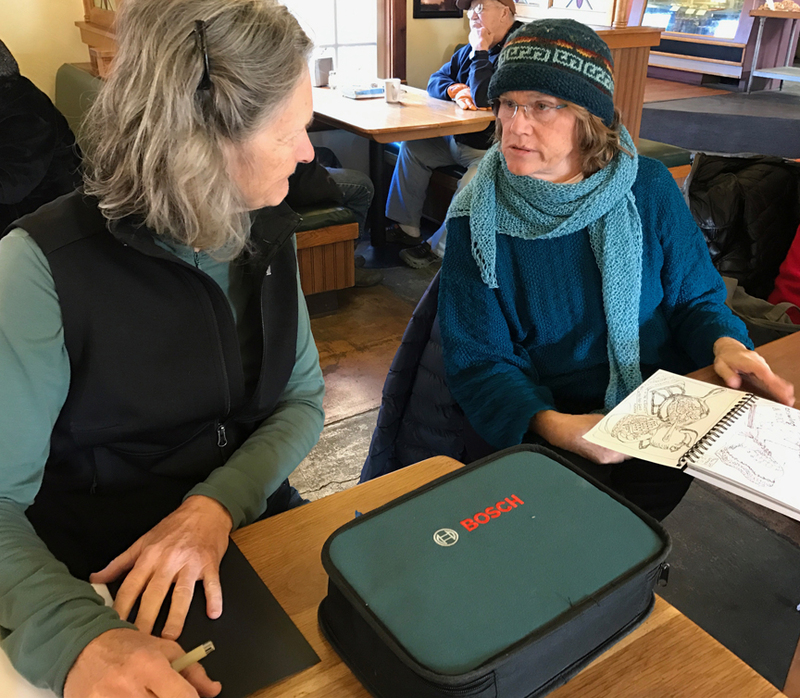 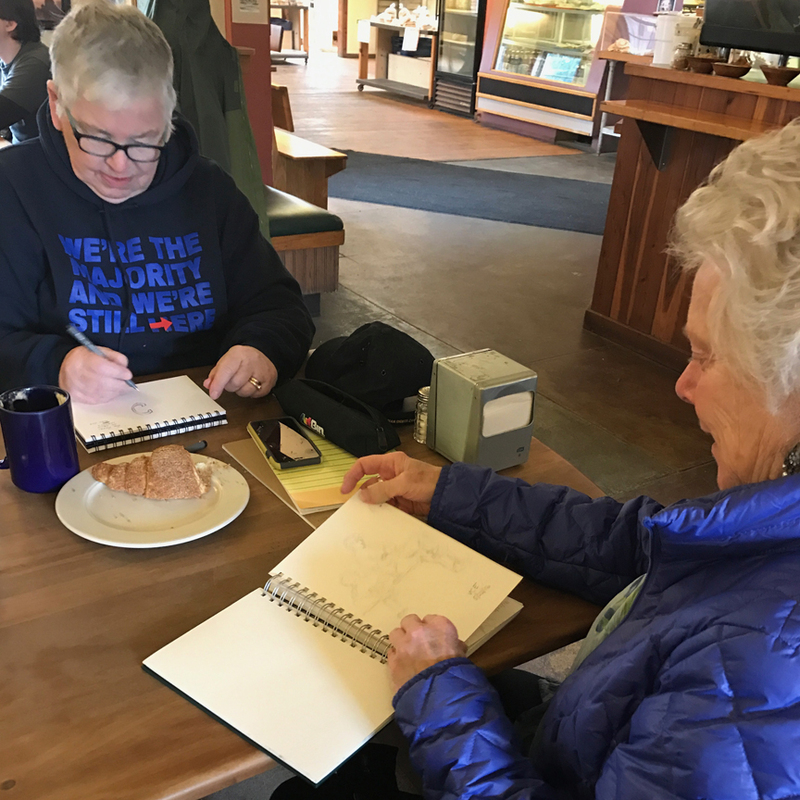 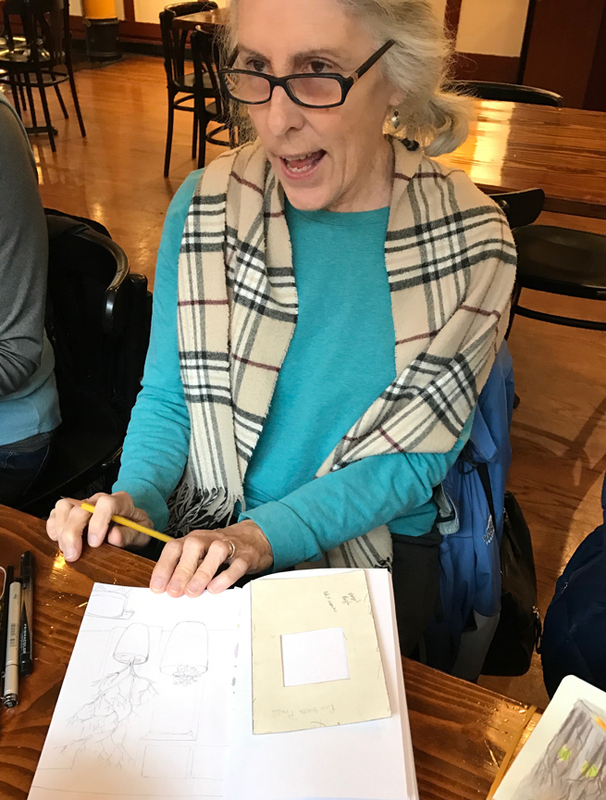 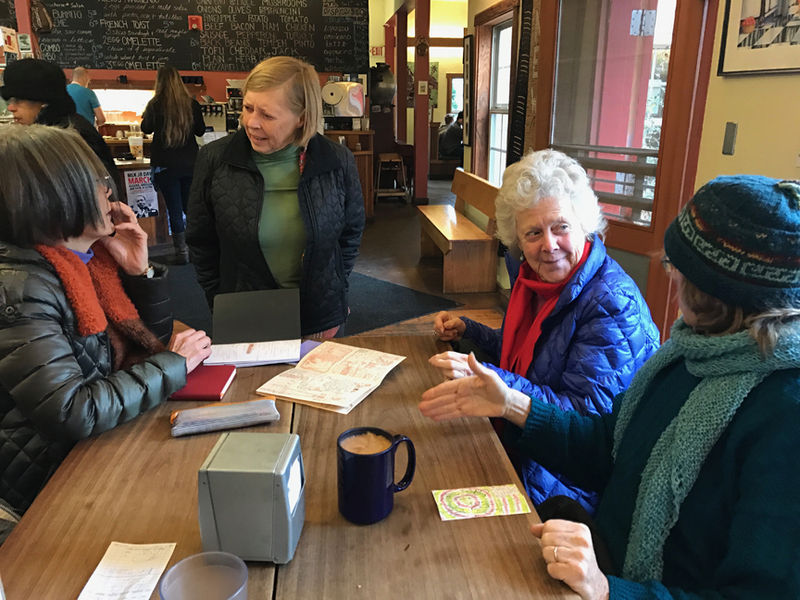 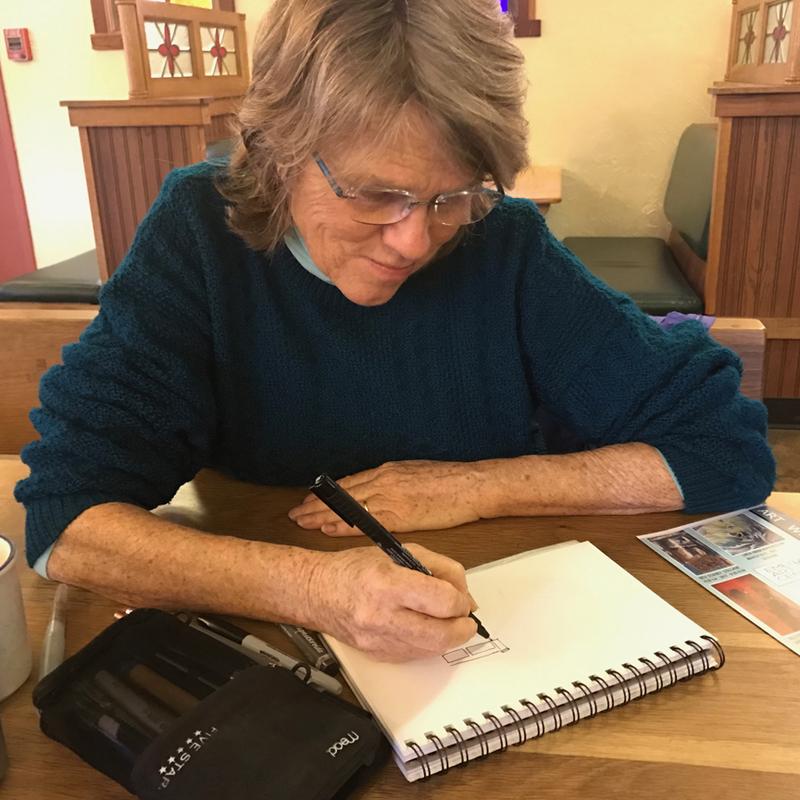 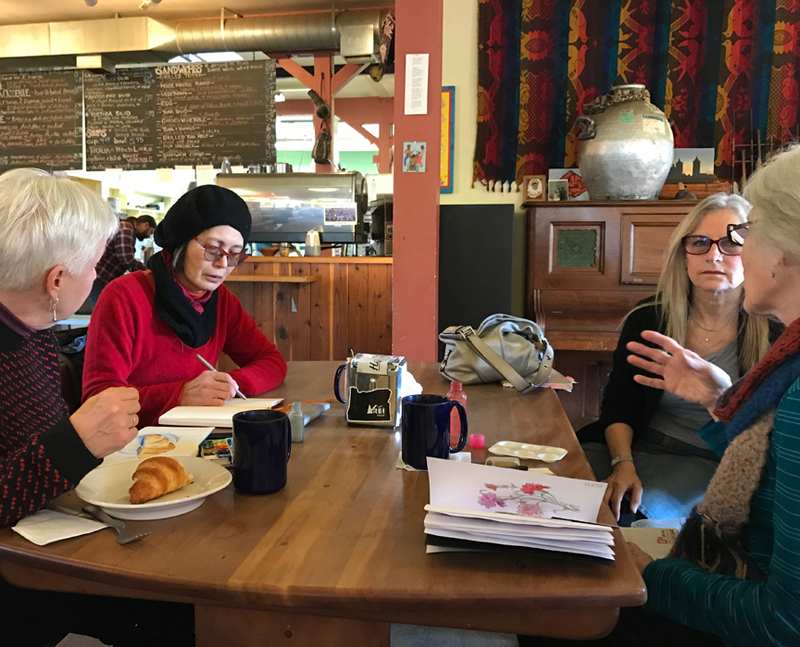 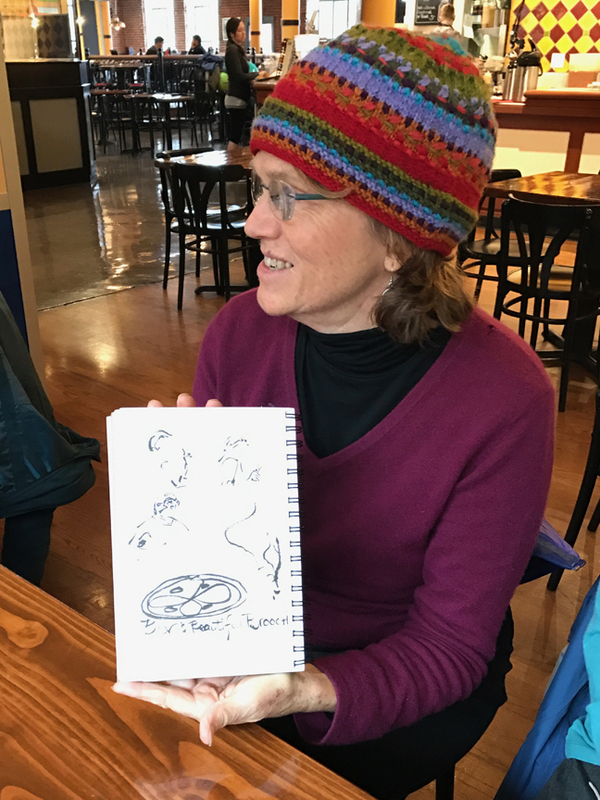 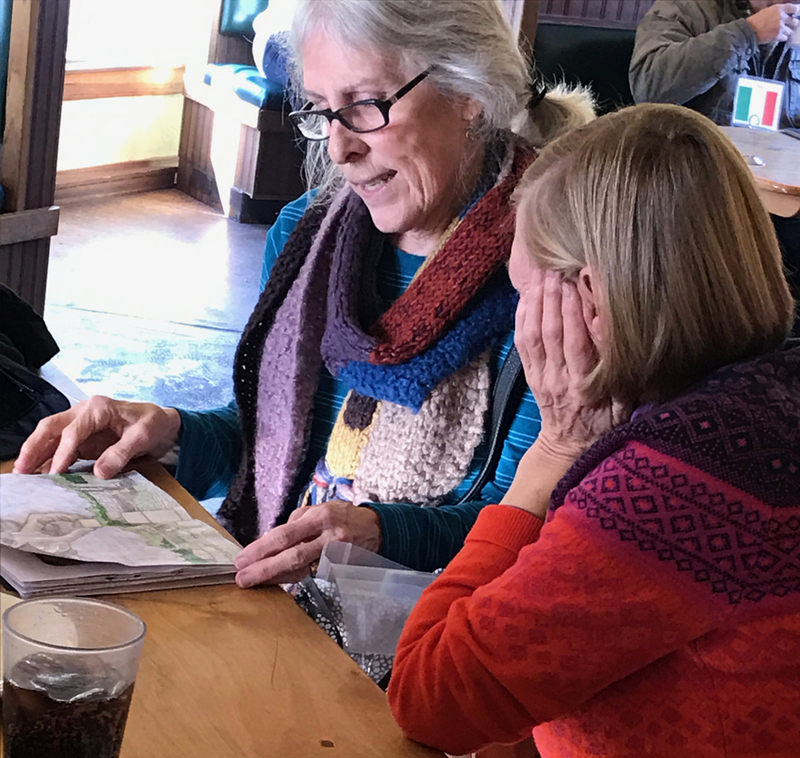 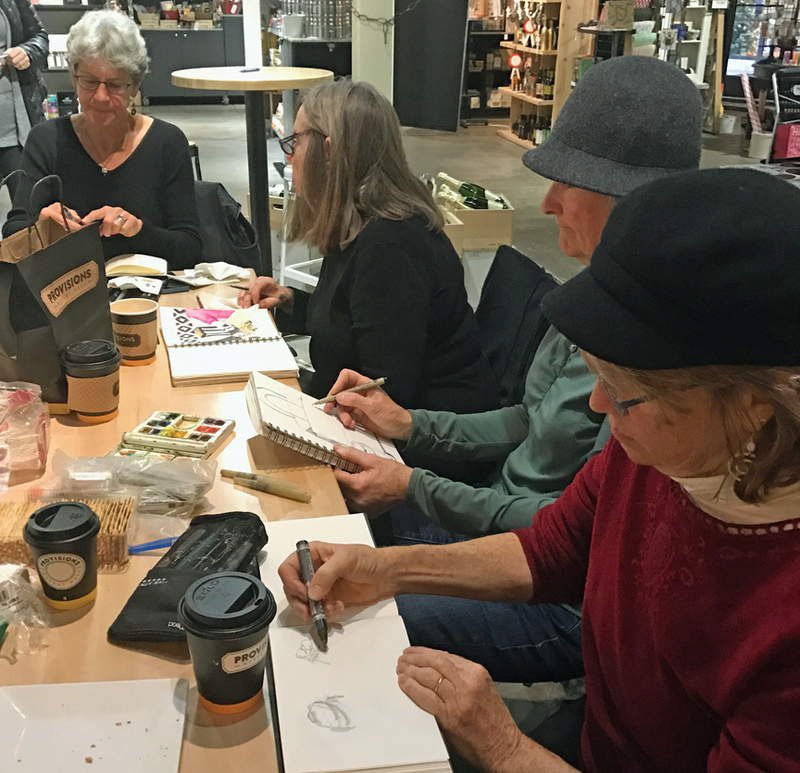 Leelan Swanson, a sketcher for 50 years & new to Eugene, joined us for the first time – here with Barb Sh and Bev, all sketching away! 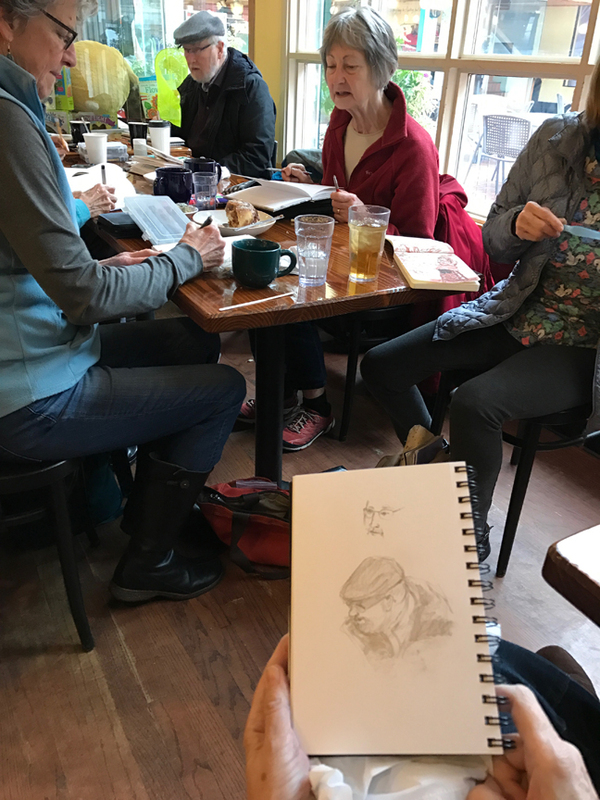 Barb Sh & Leelan enjoyed sharing sketchbooks, while Bev sketched a favorite model of ours: Ken O’Connell & signature cap. 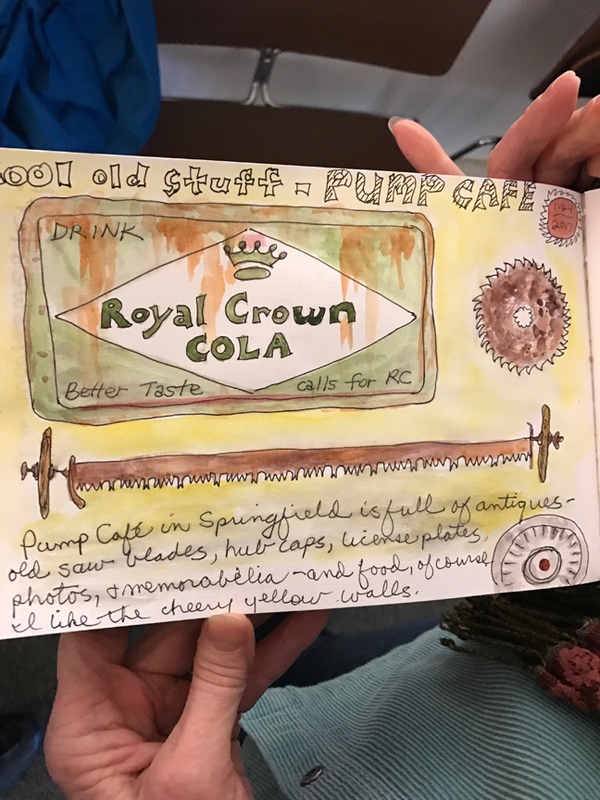 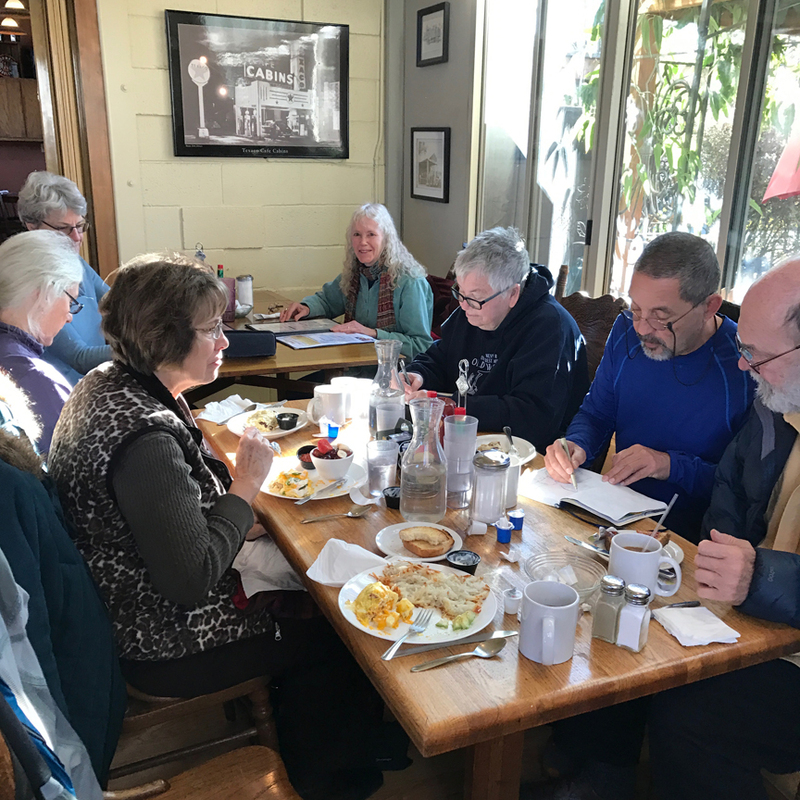 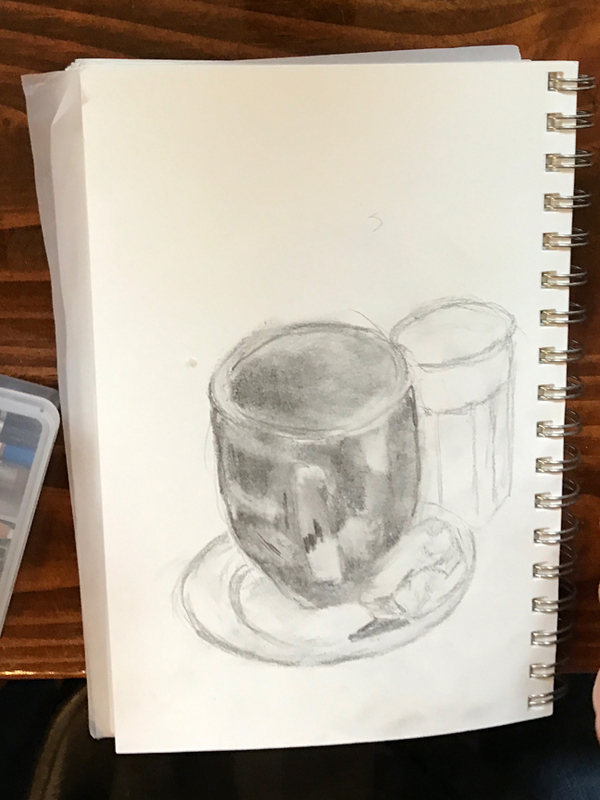 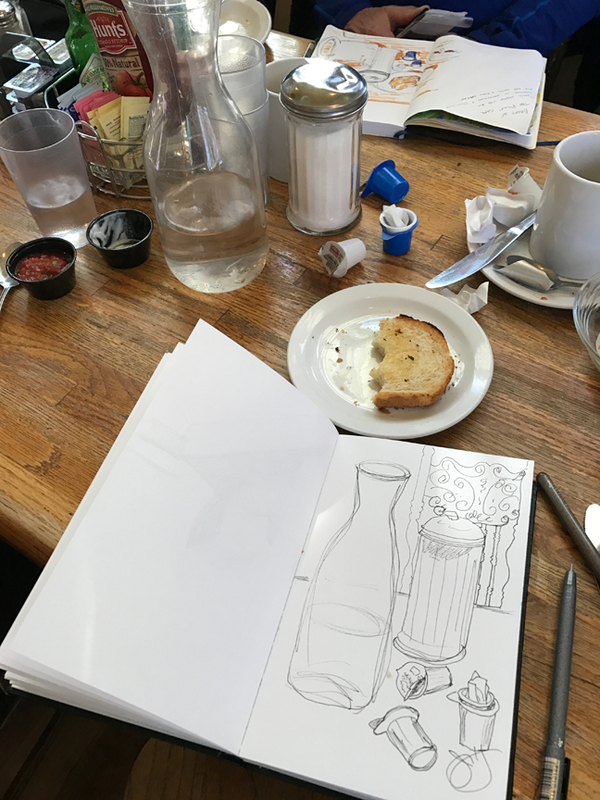 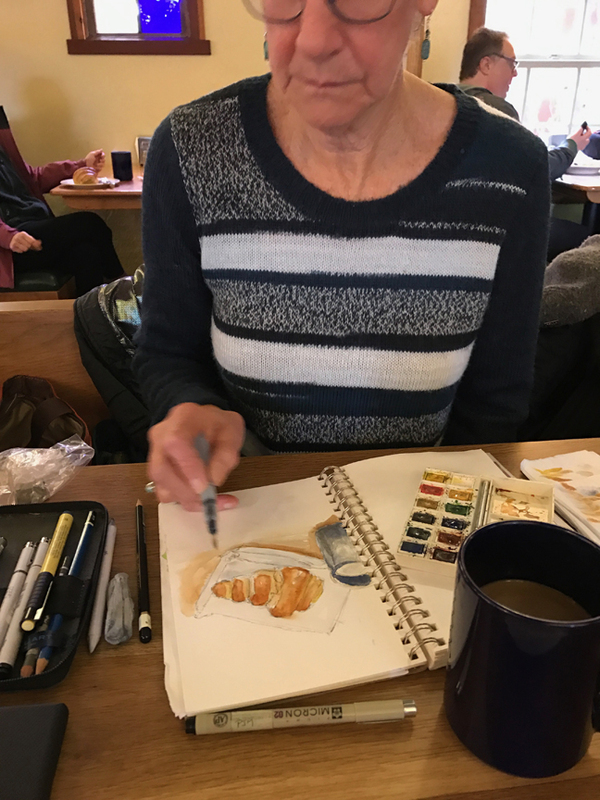 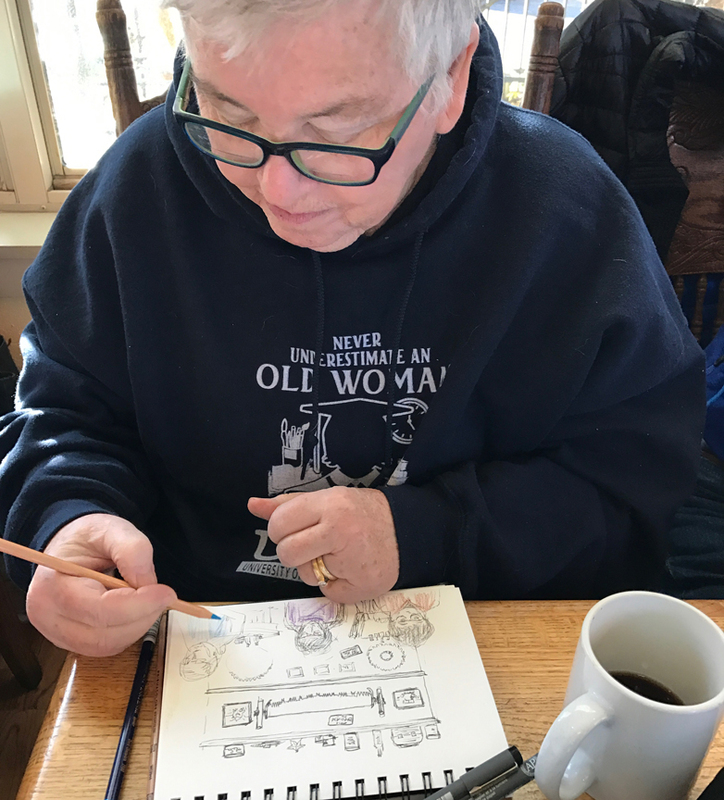 Penny wavered about what to draw, and settled on the challenge of capturing the light reflected on the dark blue coffee cup – wow! 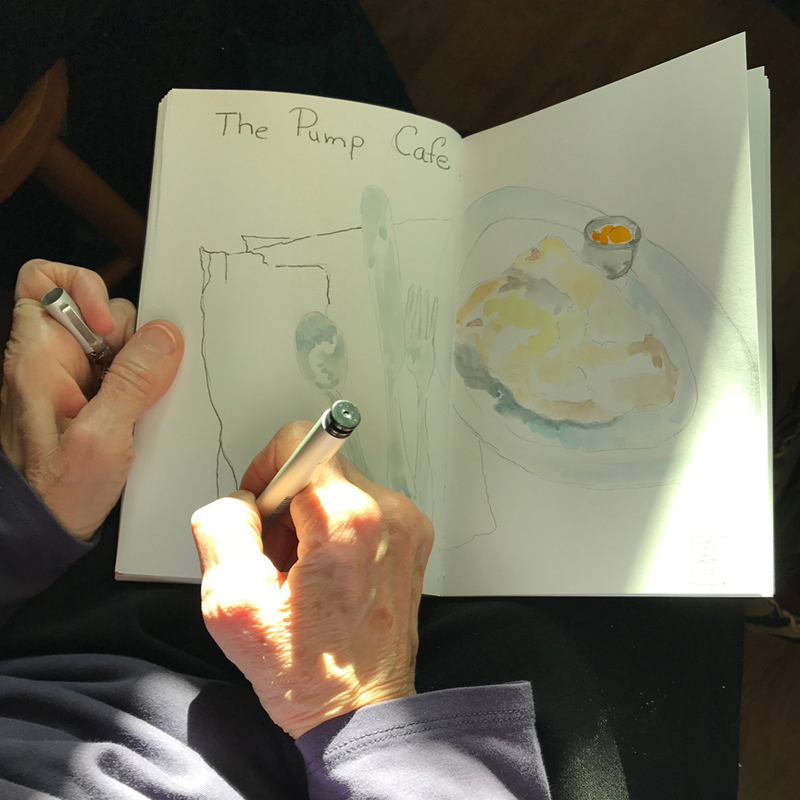 If you look over Ken’s shoulder out the window, you can see what Hugh is sketching – the potted plants framed by windows. 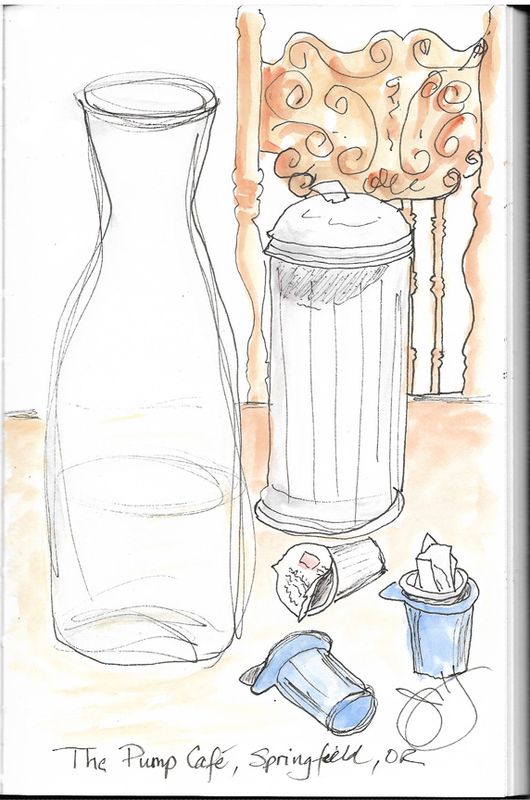 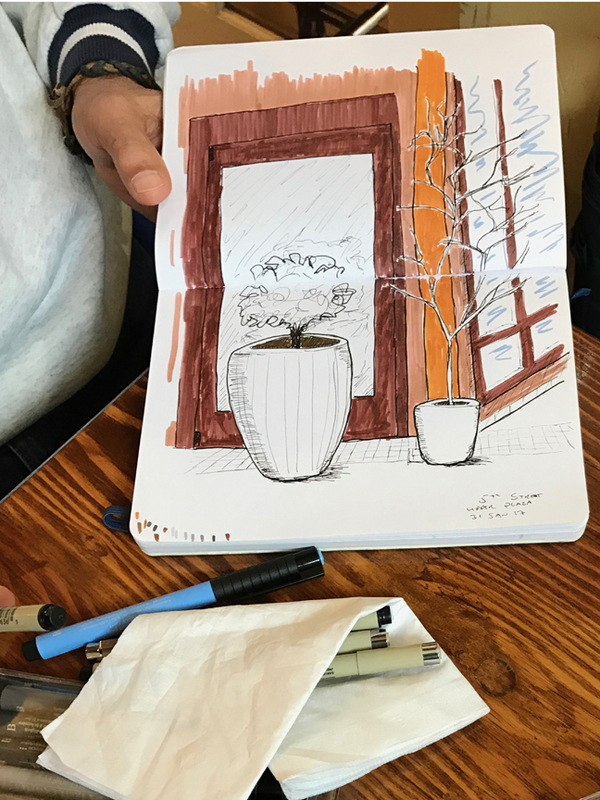 Here’s how Hugh’s sketch developed – color makes a difference! 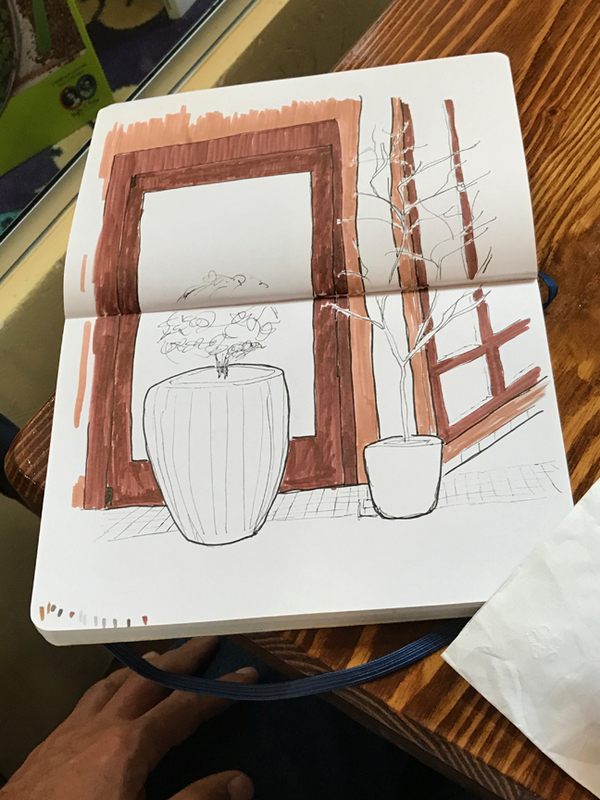 Barb So was sketching the same view, but with different effects. 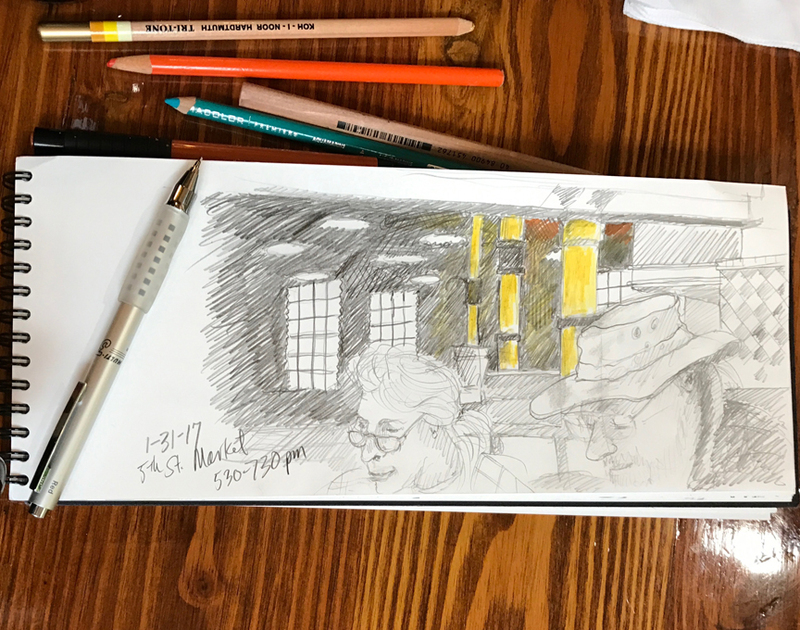 Ken was looking the other way across the room – he said he was trying to capture the vastness of the space, with Barb & Erik in the foreground. 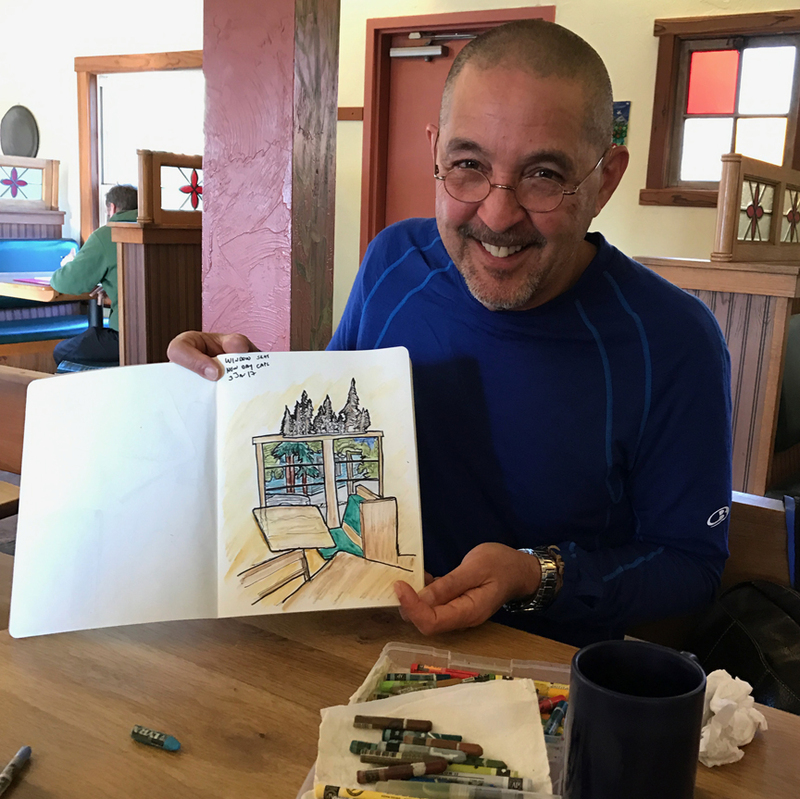 His sketch is an example of his oft made statement, “go darker” and of carefully selected color placement. 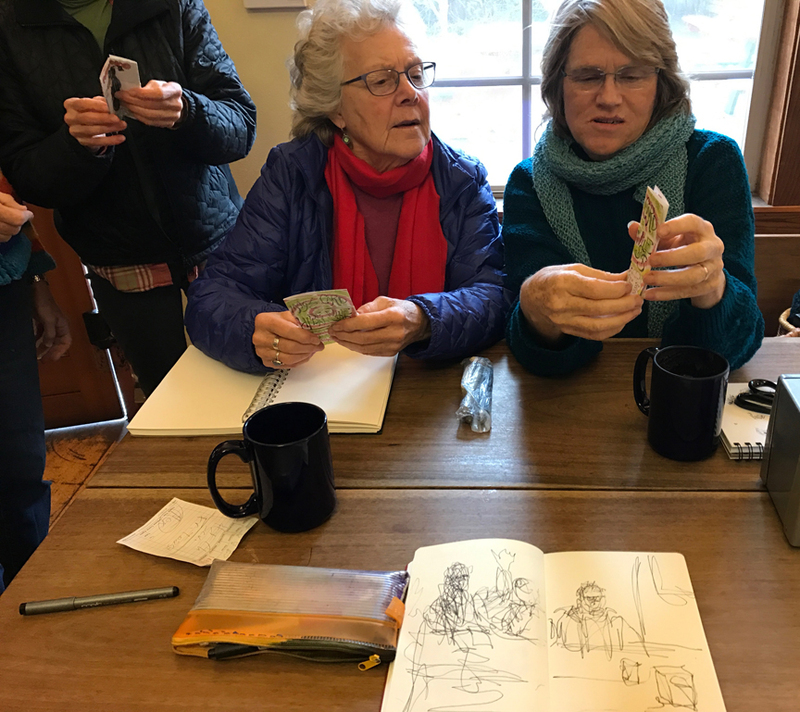 Heidi got us into a discussion of “foreshortening” ( Jane’s first attempt at getting Siri to tell us turned out to be a hilarious to us description of the use of shortening); Penelope showed sketches from last time; and Barb A was busy getting info on our next show of our sketchbooks at the Obsidians Lodge to honor Anne Bonine. 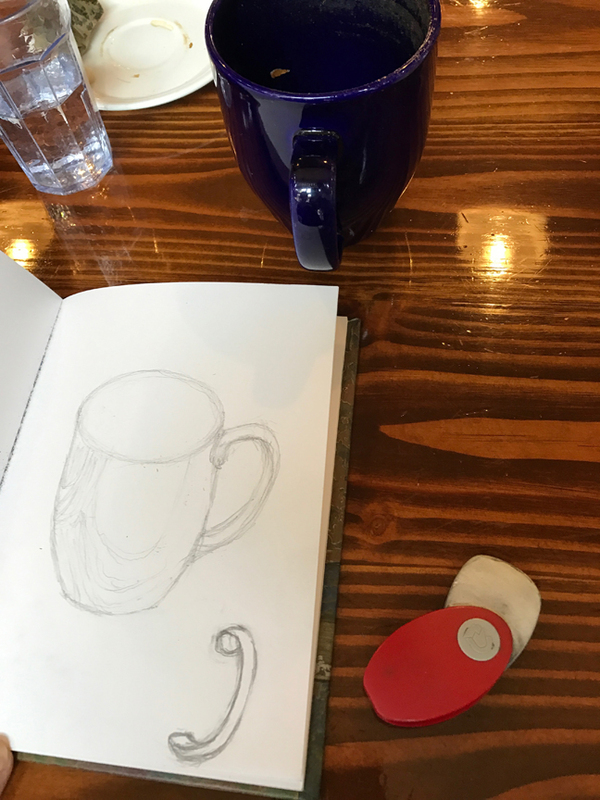 What You See is What You Sketch! 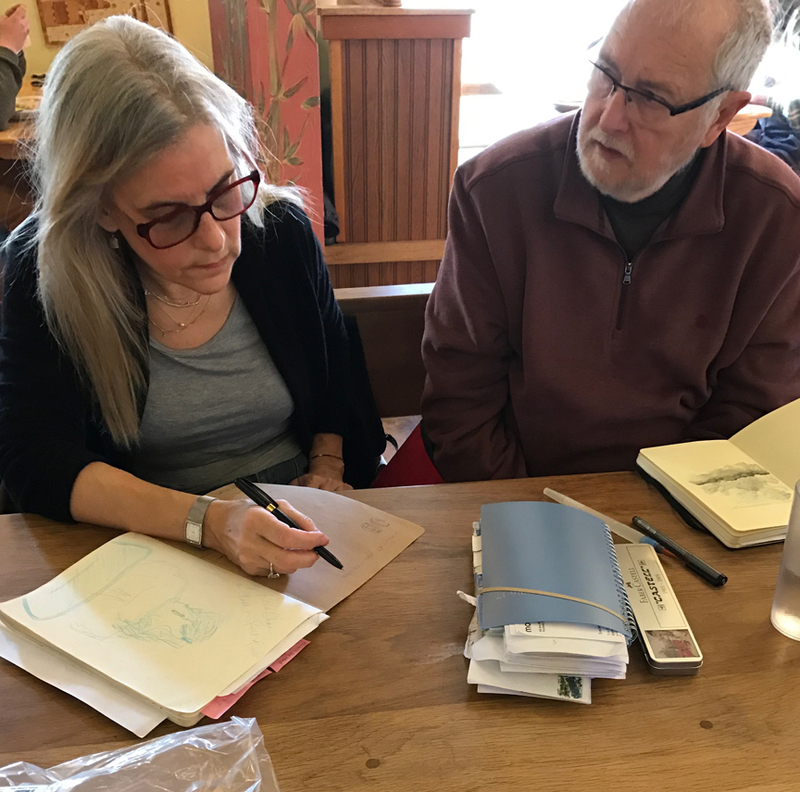 Ken barely had time to say hello to newcomer Bev Taylor and they were both into sketching! 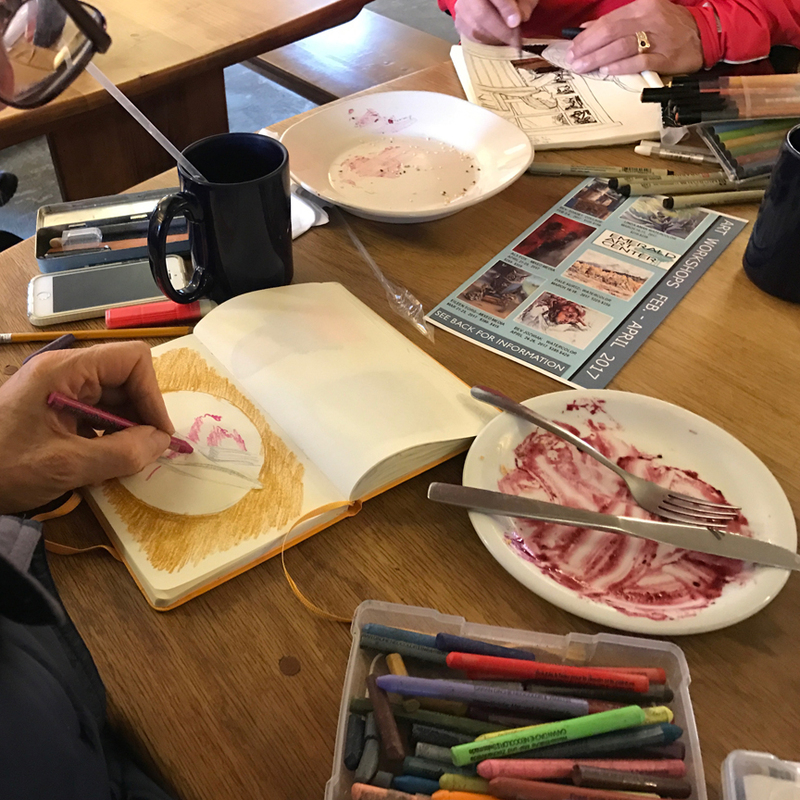 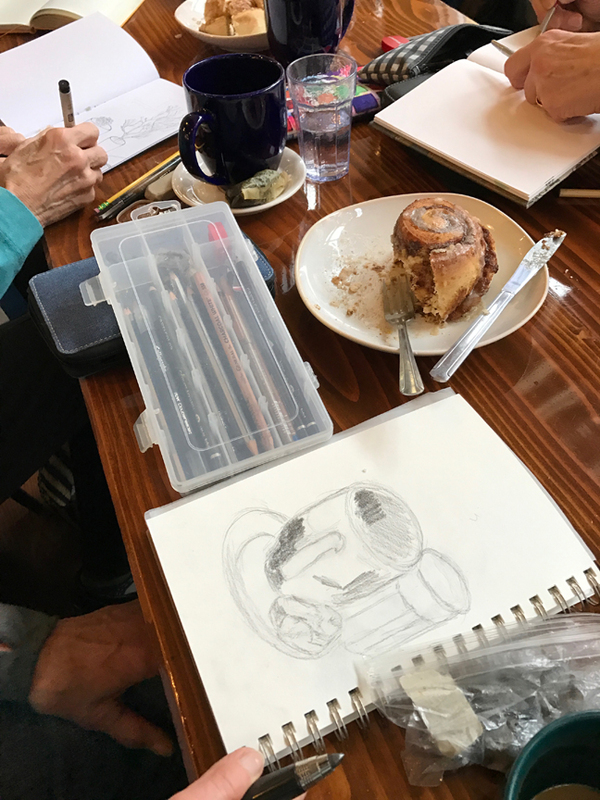 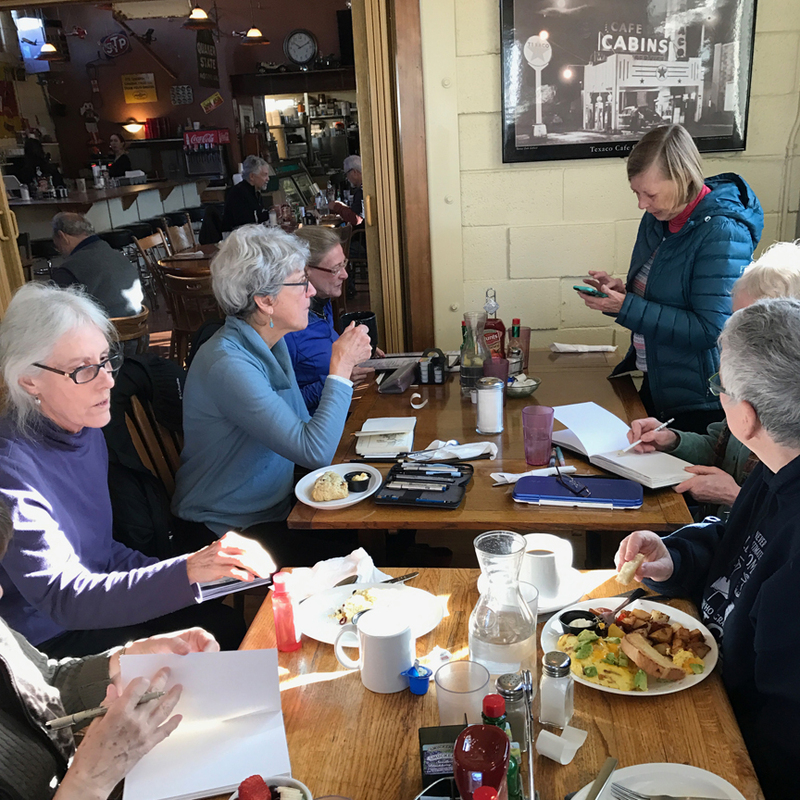 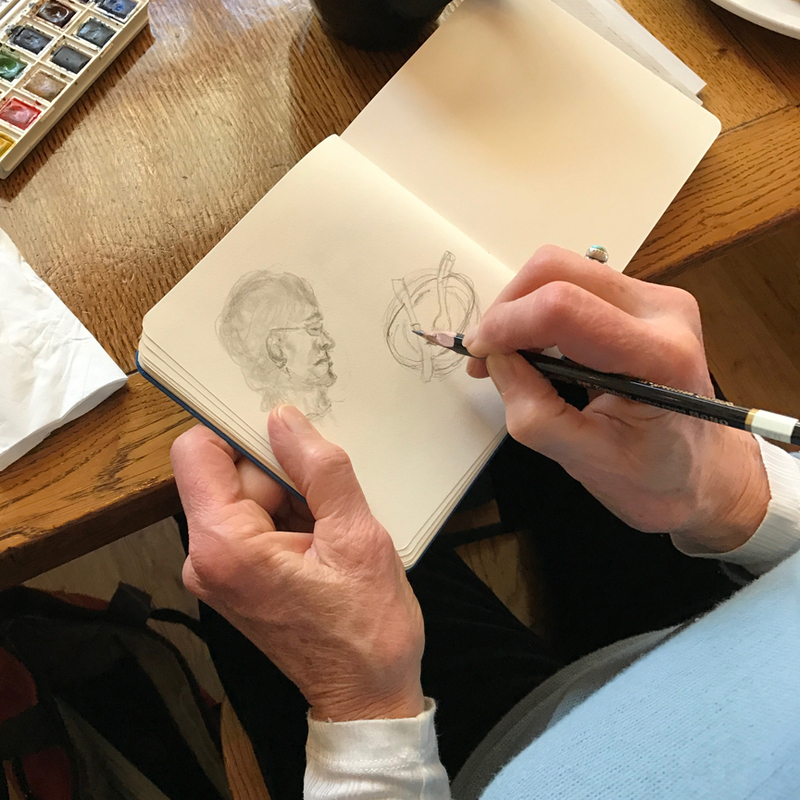 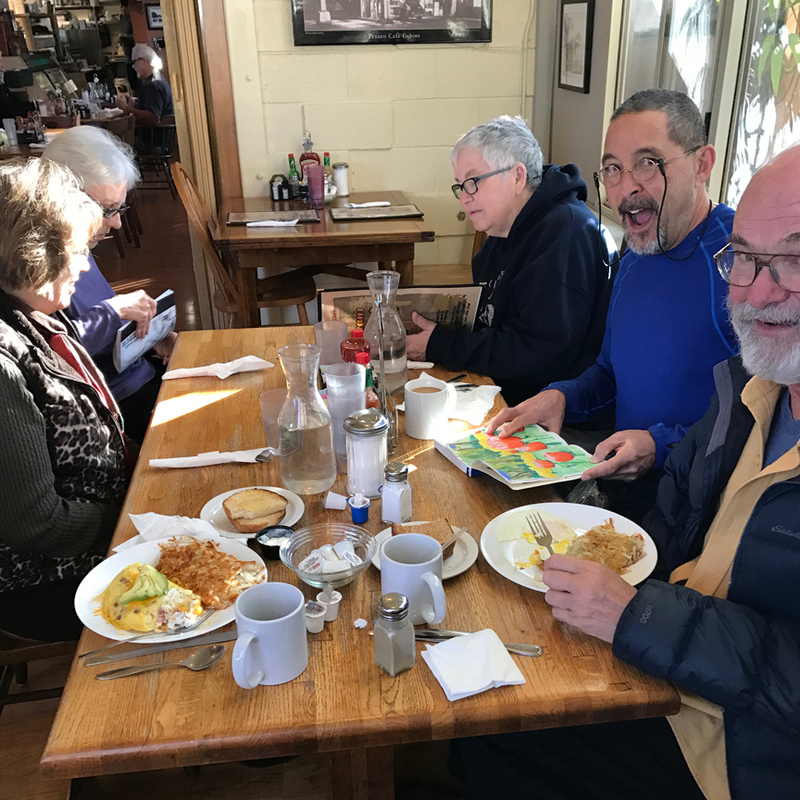 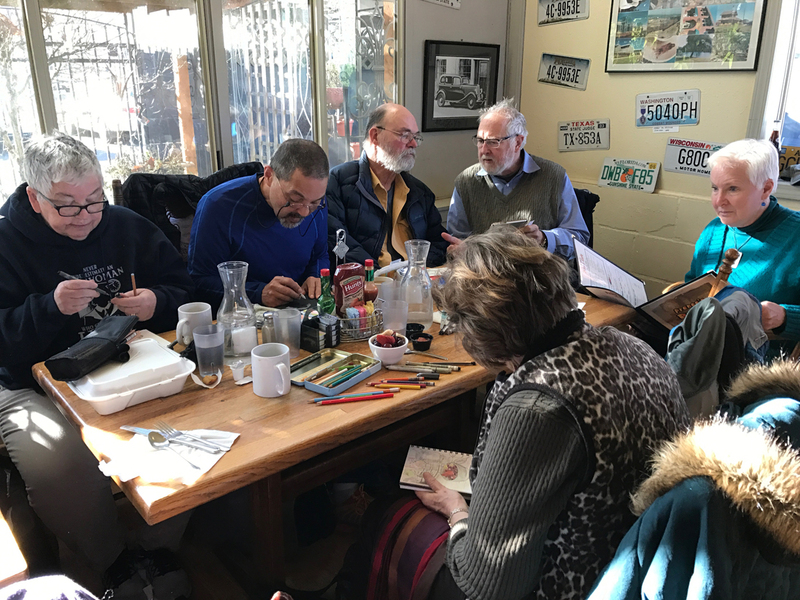 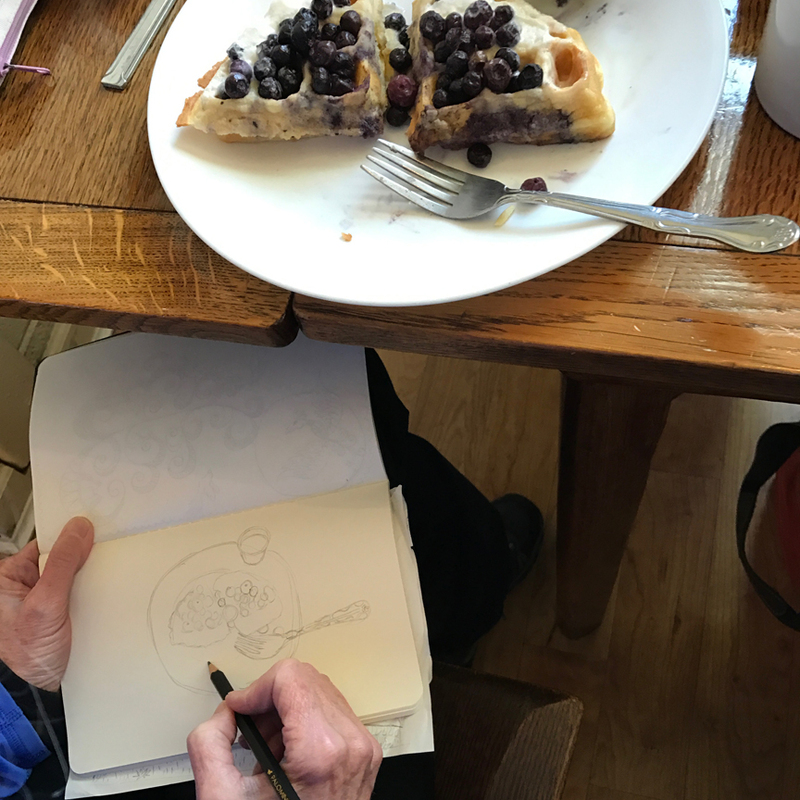 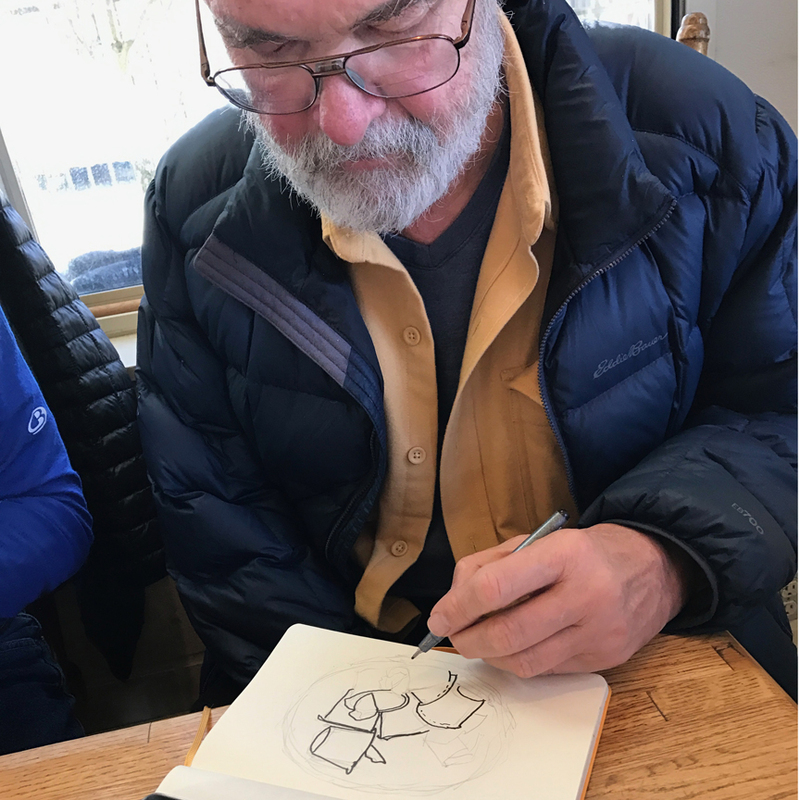 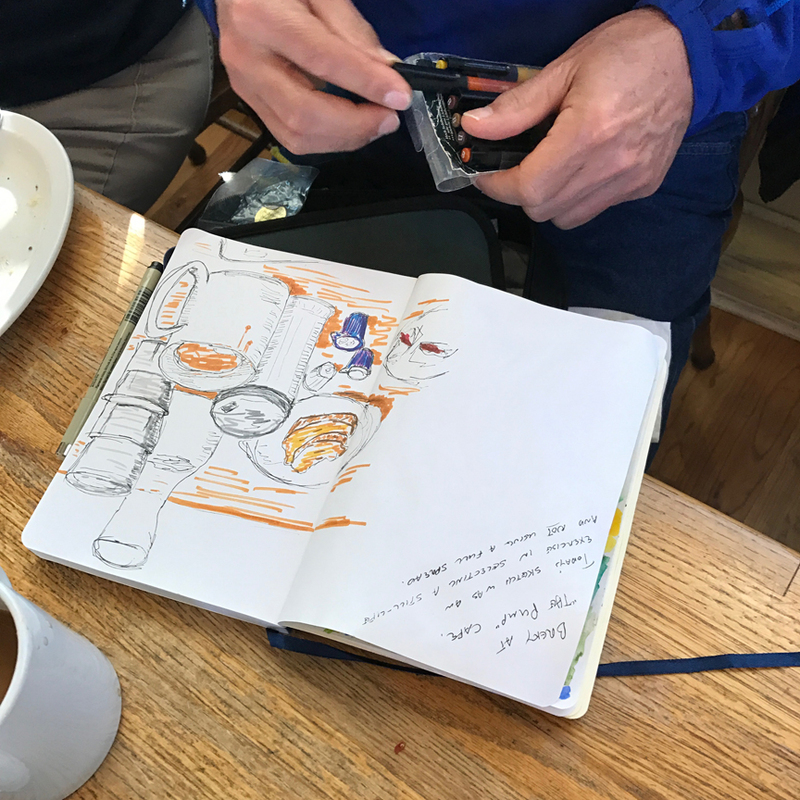 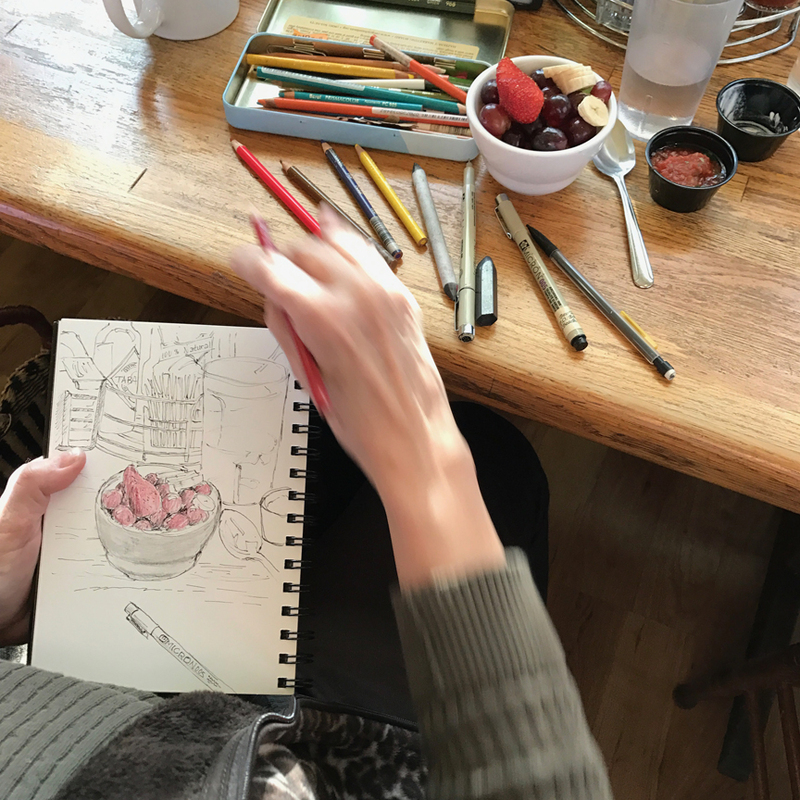 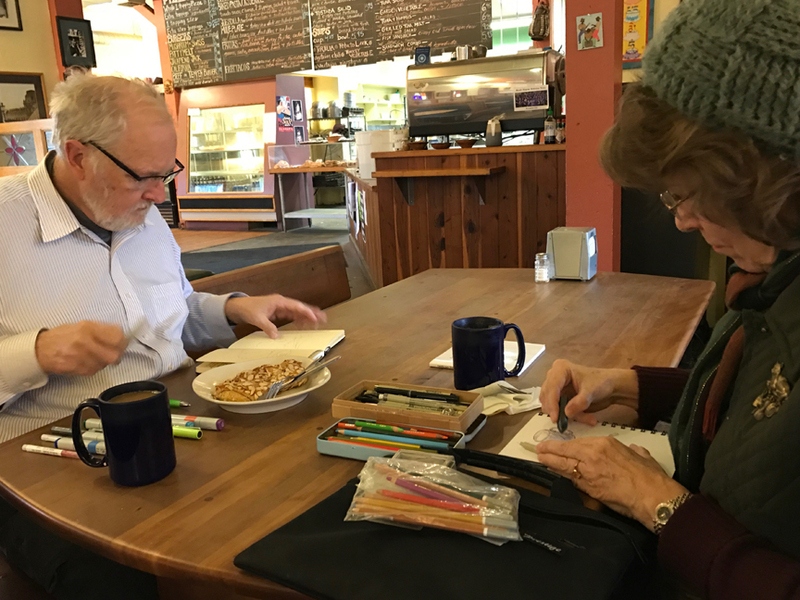 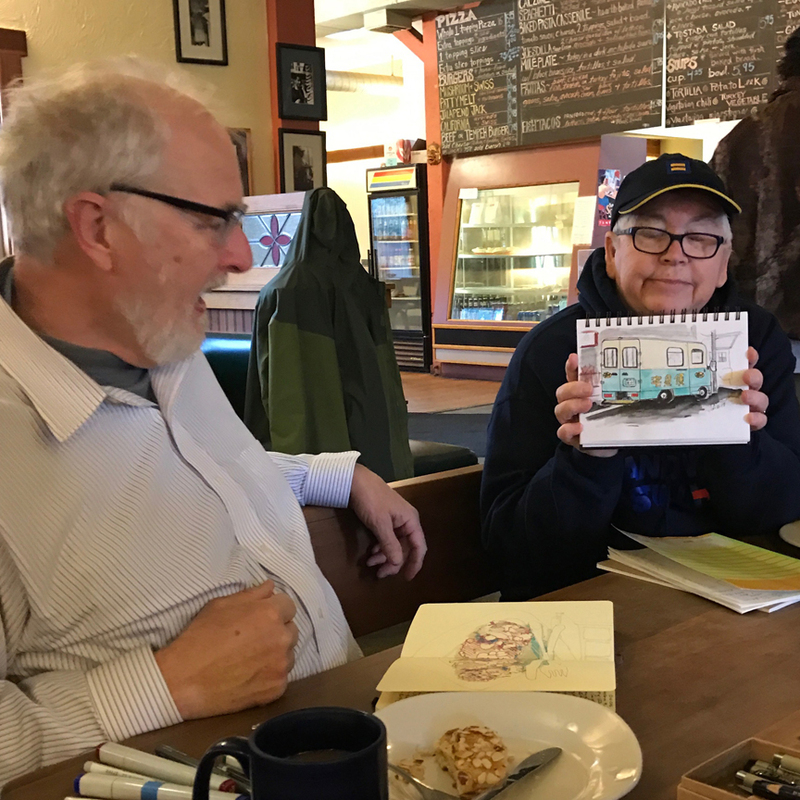 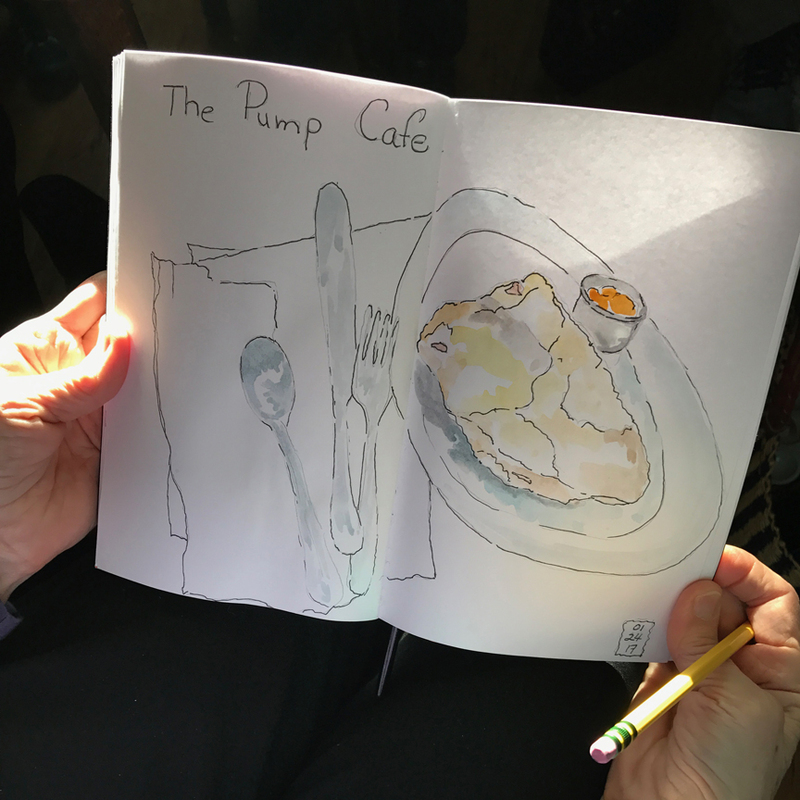 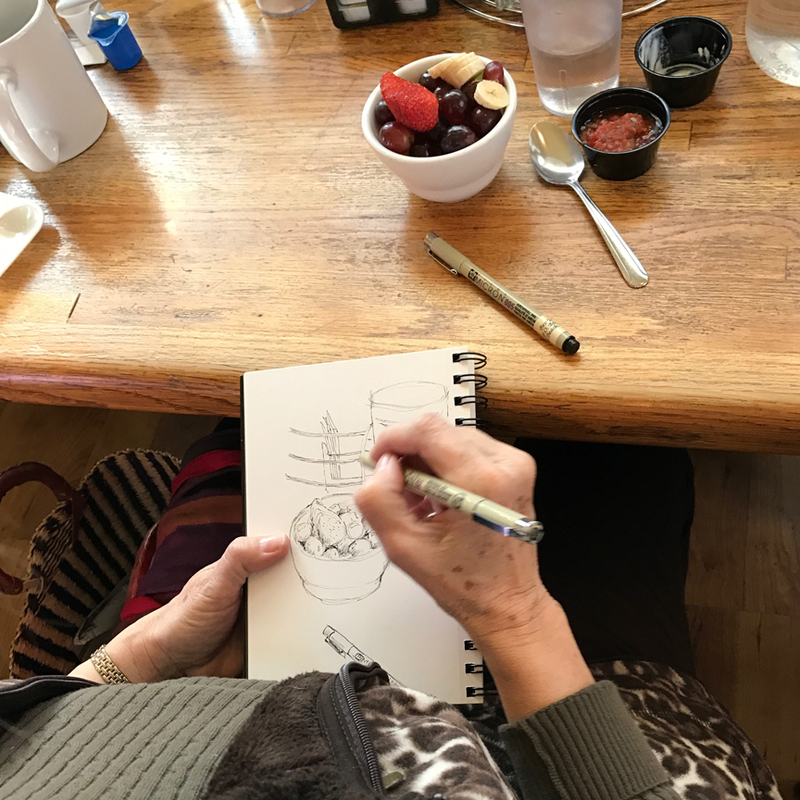 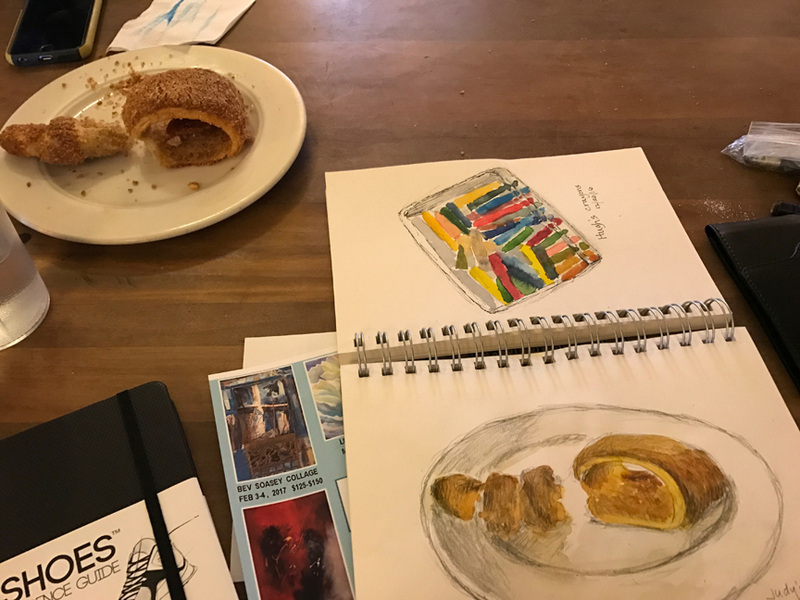 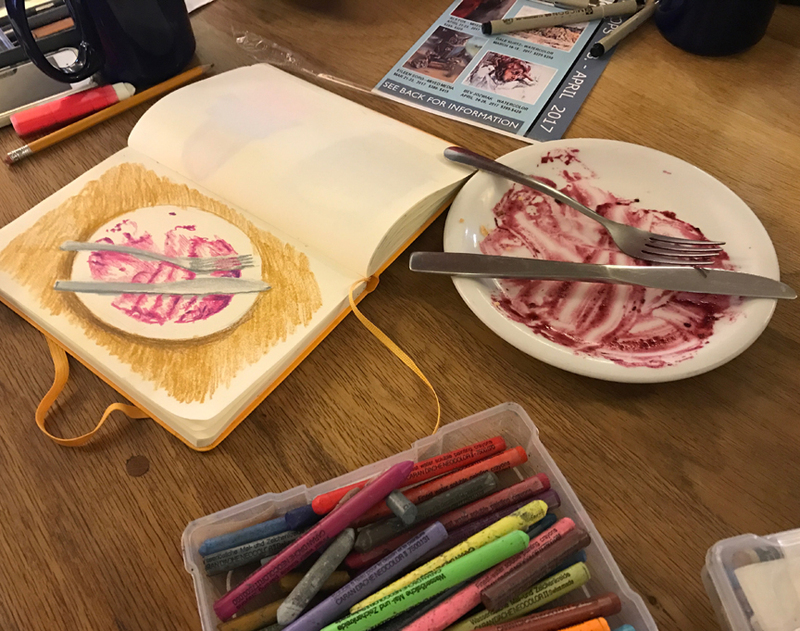 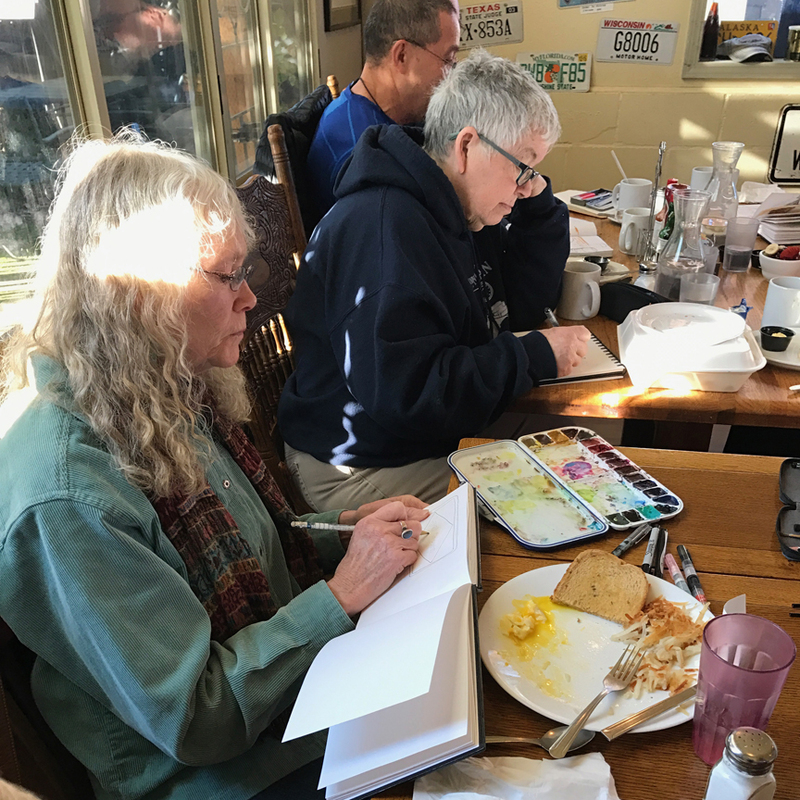 Ken sketched his rapidly disappearing Bear Claw pastry, and Bev confessed she loves to do portraits – lots of models here! 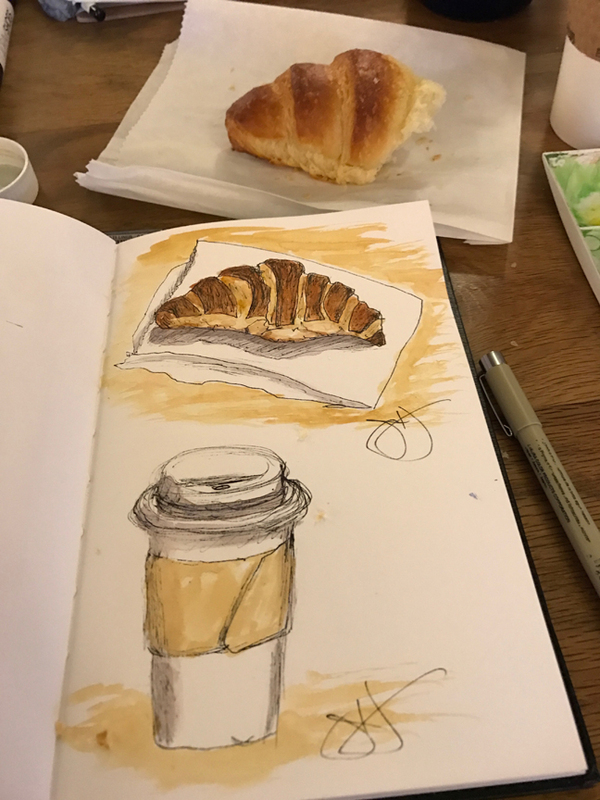 Jane sketched her croissant & coffee, and Penny did the same from across the table from her (they had to be fast, before it got eaten up). 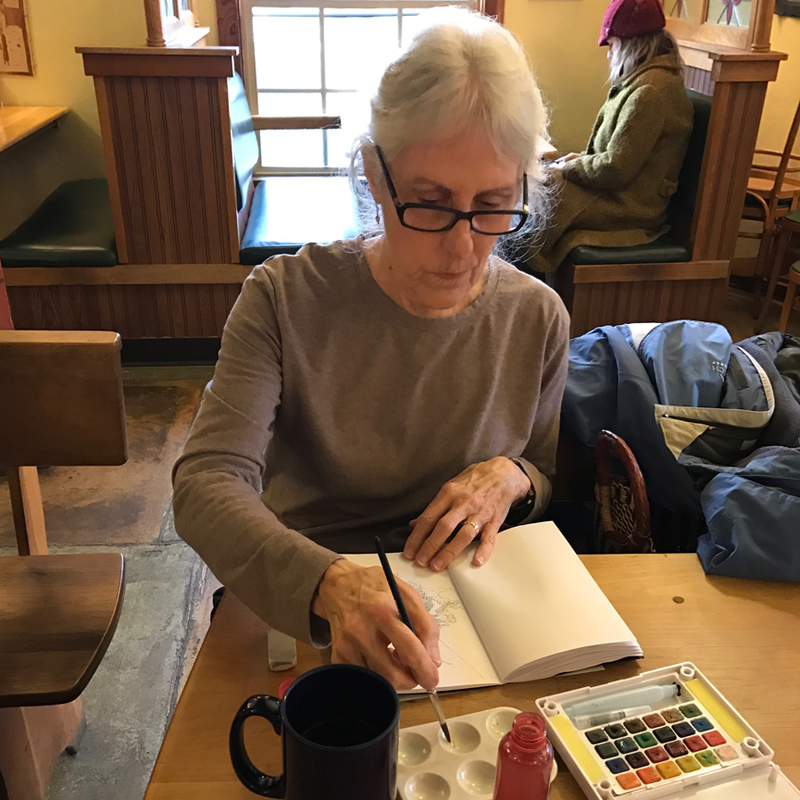 Penny also shared a sweet bird she’d painted at home, and ended the morning by sketching the ethnic painting on the wall. 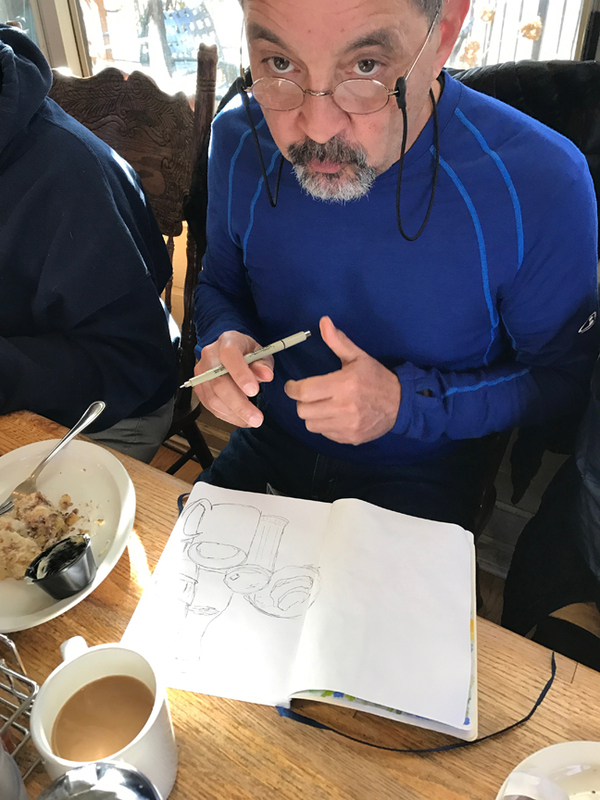 Hugh intently worked on the scene across from him in a booth. 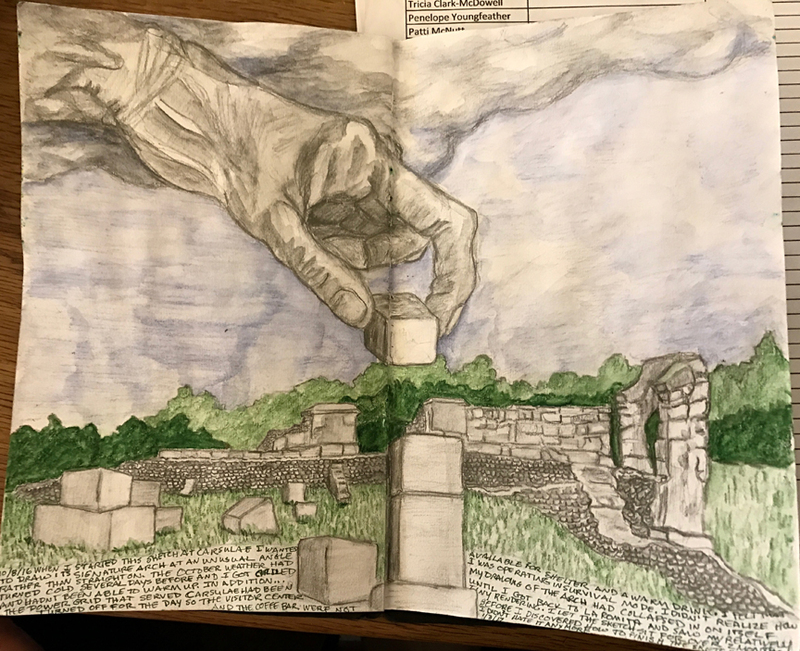 Erik! 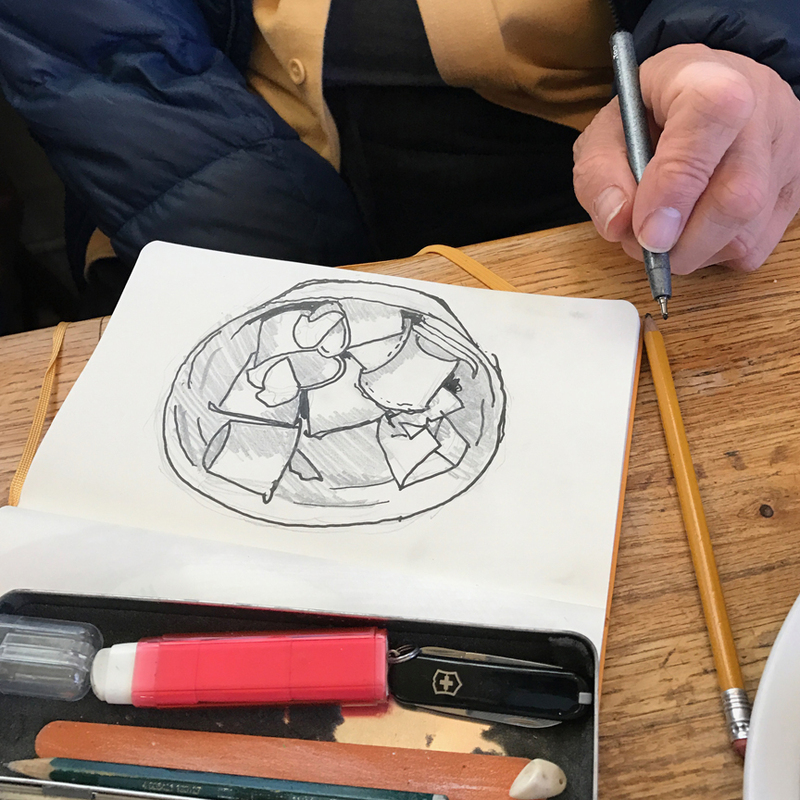 You didn’t sketch your pie first! 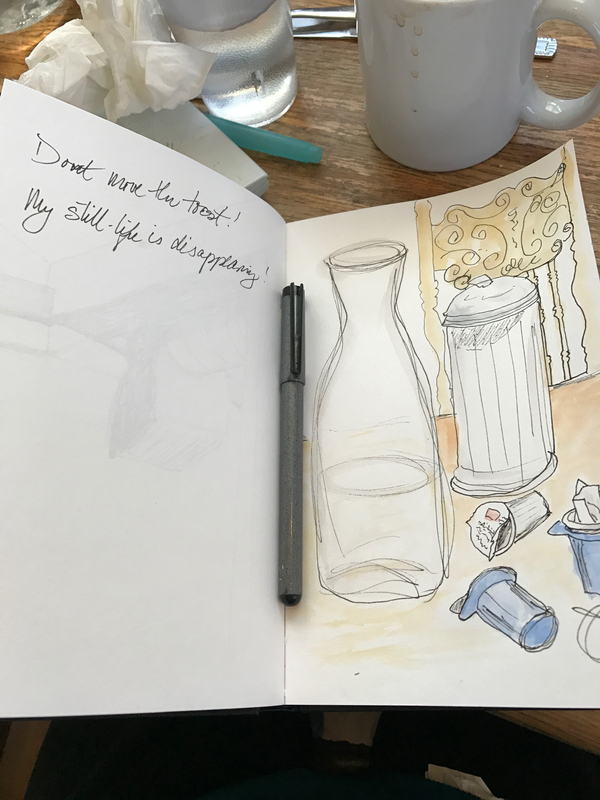 Aha, he said, and rapidly drew the colorful remains. 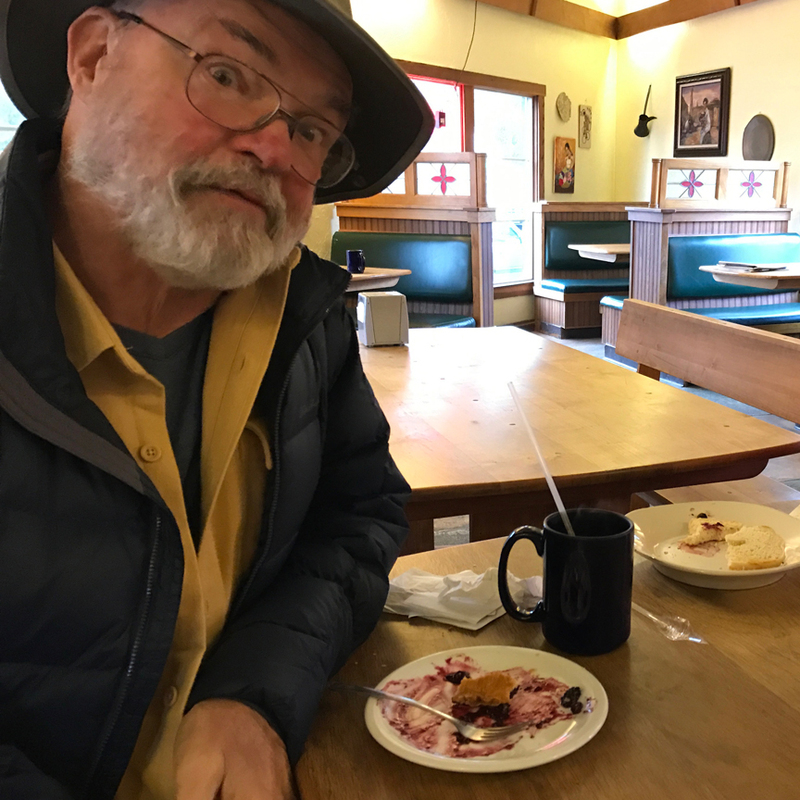 No stopping this guy. 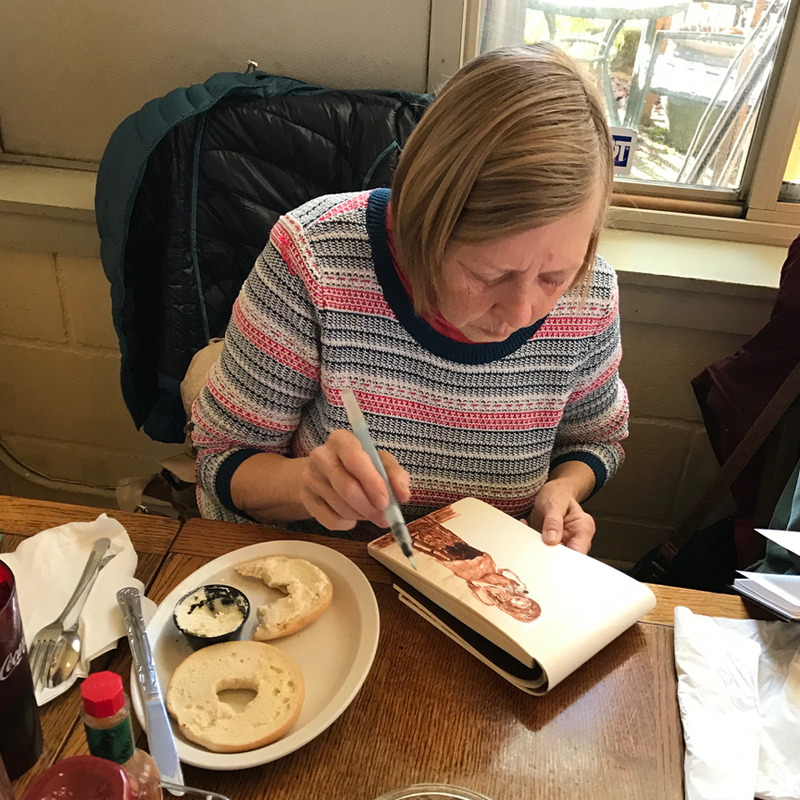 Barb So was finishing up a sketch she started at home of her sweet puppy – how can you not adore that face! 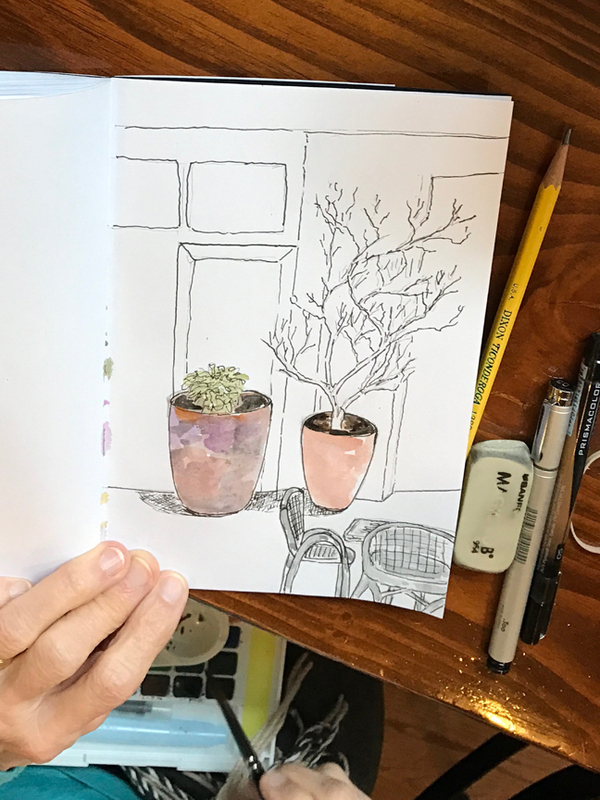 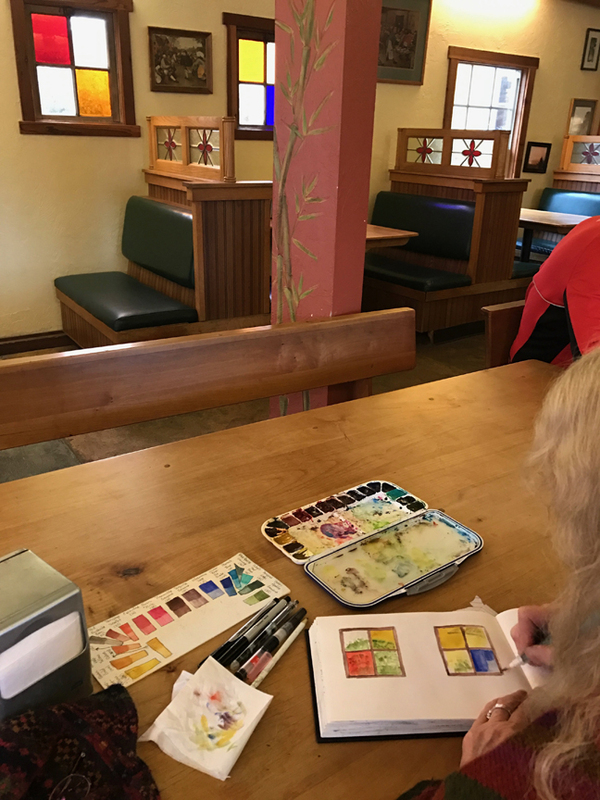 Tricia started in with the colored glass windows, and her sketch quickly grew to include views from outside as well as comments. 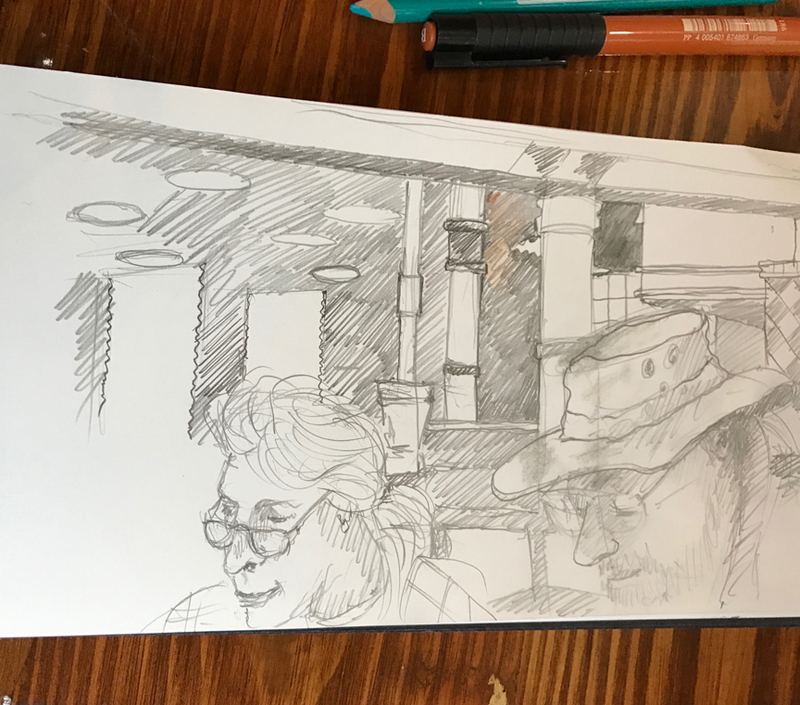 Meanwhile back at the other end of the table, Judith had come in and was delighting Ken with the sketches she did while in Japan. 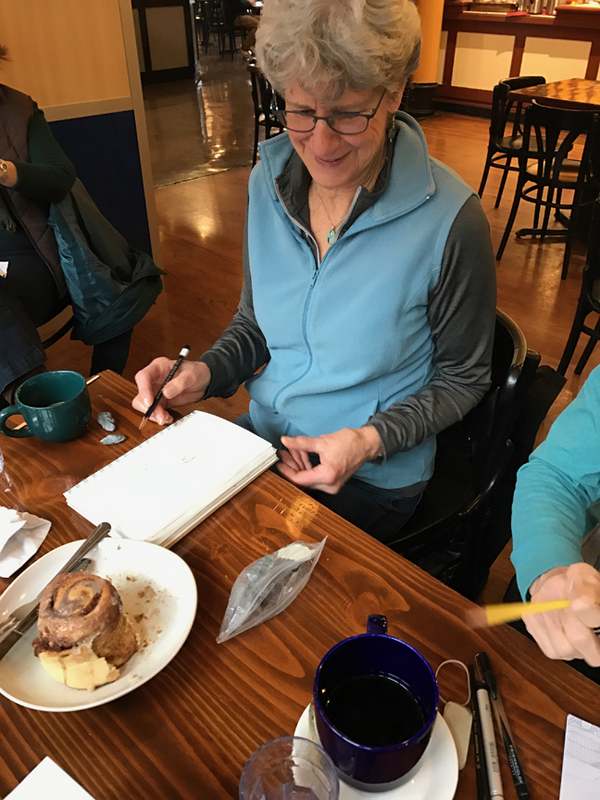 Barb A slid in across from Judith, and perfectly captured Judith’s pastry! 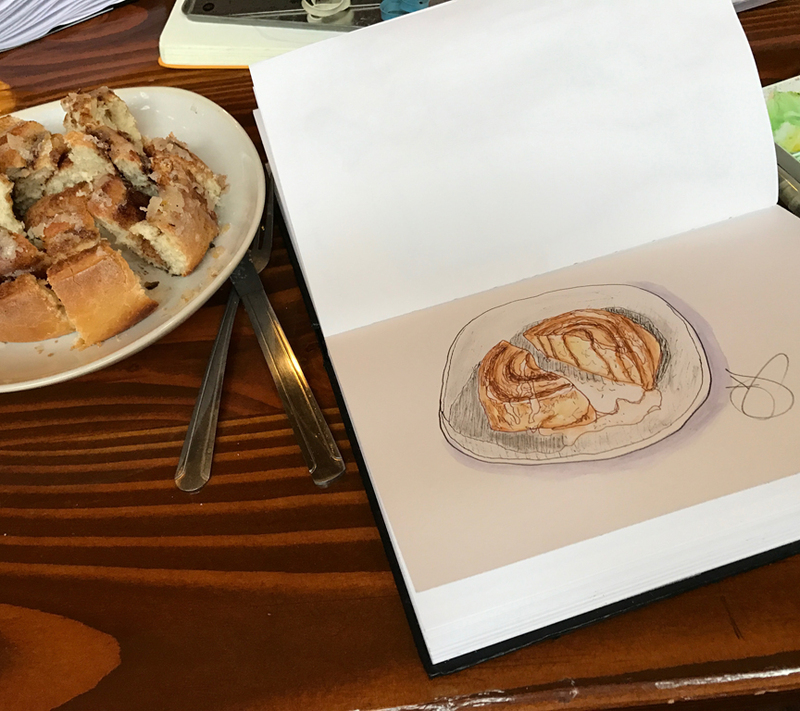 There’s more than one way to enjoy a tasty treat. 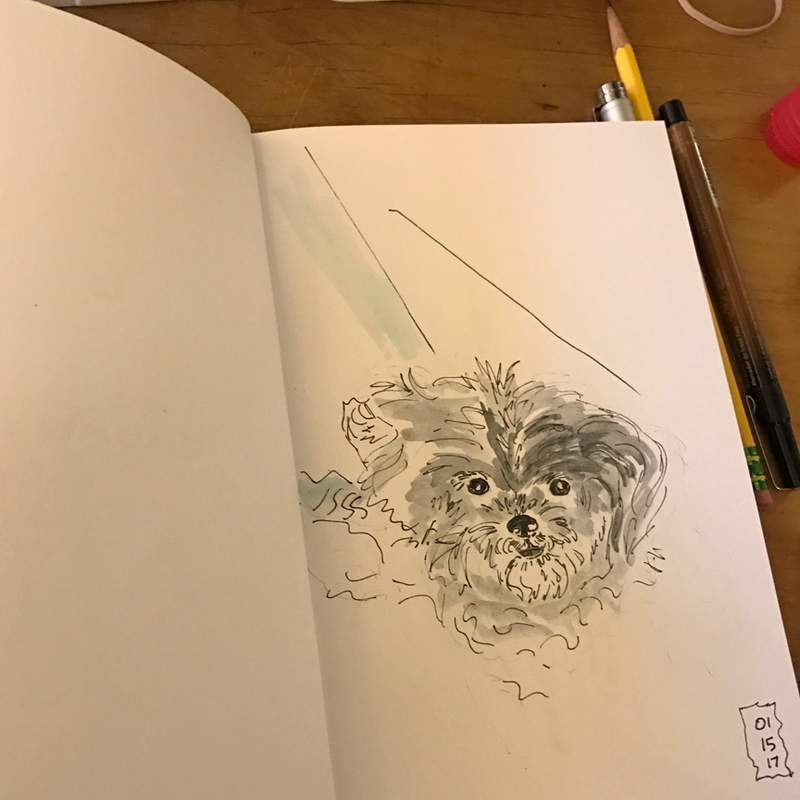 And it’s never too late to get in a sketch, as Penelope demonstrates. 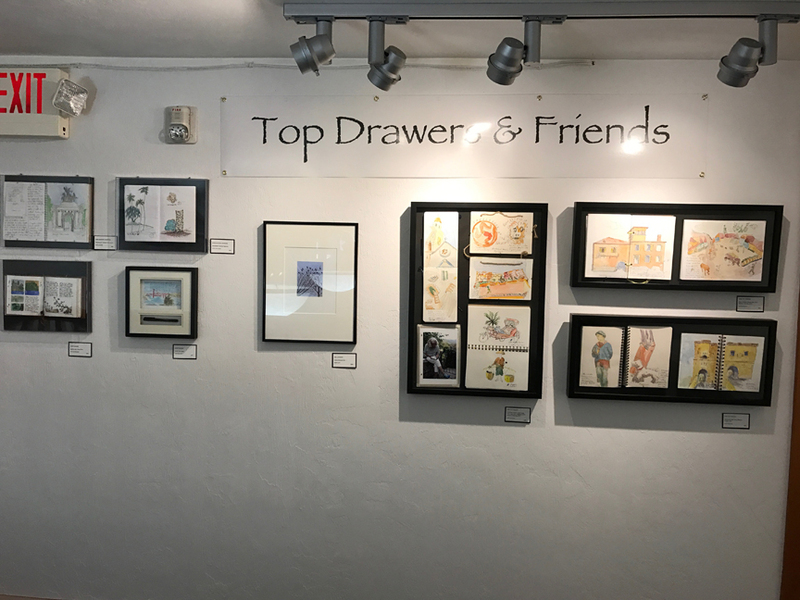 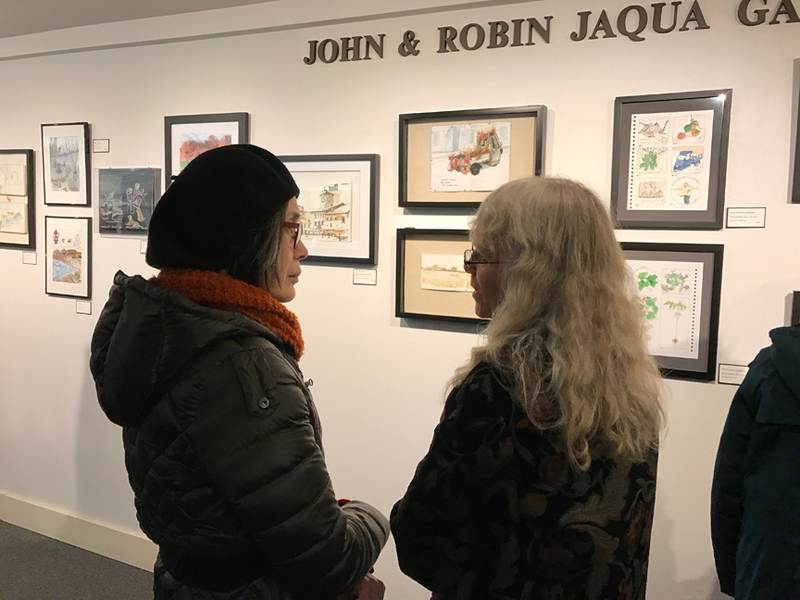 The opening reception of our sketch show – thirteen sketch artists showing work from the sketchbooks, and sometimes the sketchbooks themselves! 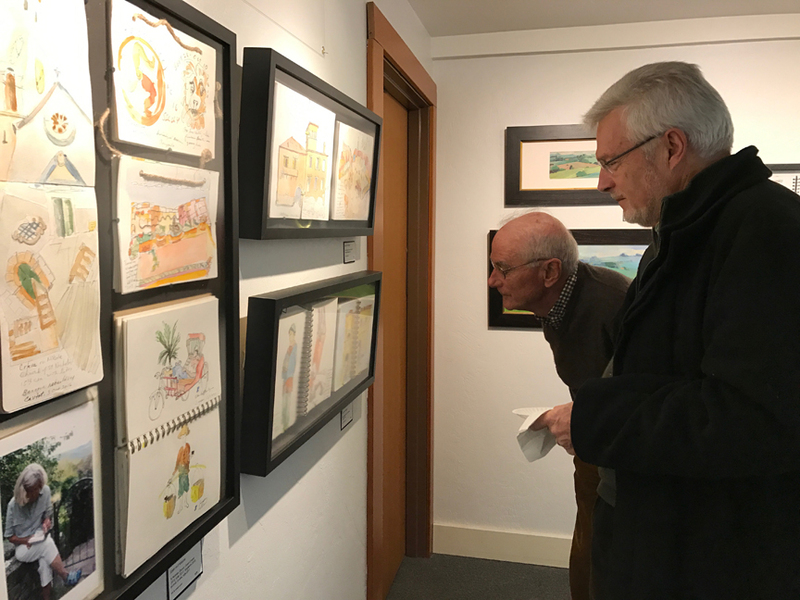 Heidi looks at Anne Bonine’s and Jane’s sketchbooks, while Paul and Jim look at the three shadowboxes full of Joby’s work. 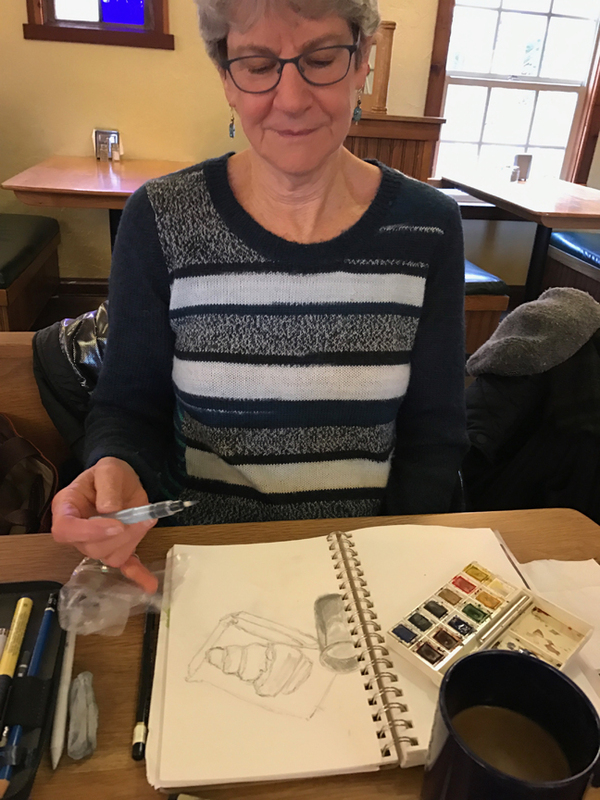 Phoebe, who took an online course with Jane, says she can hardly wait to get back to sketching. 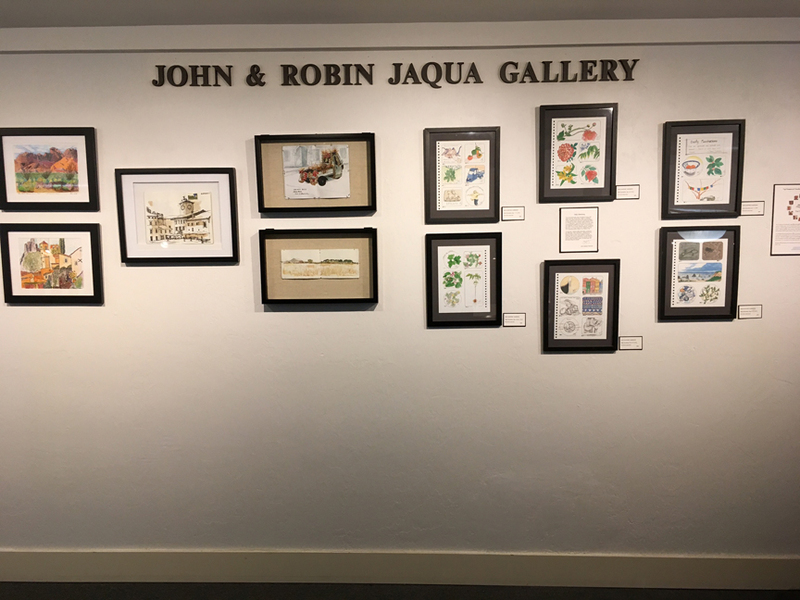 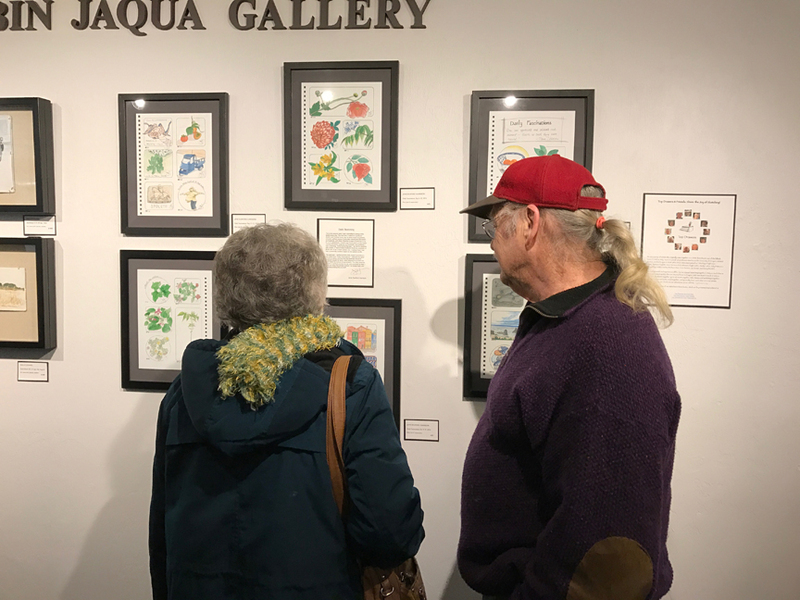 Joby, Barb A, Erik, Cathy & Ken, Tricia and Sandy, all enjoyed seeing the variety of sketches displayed. 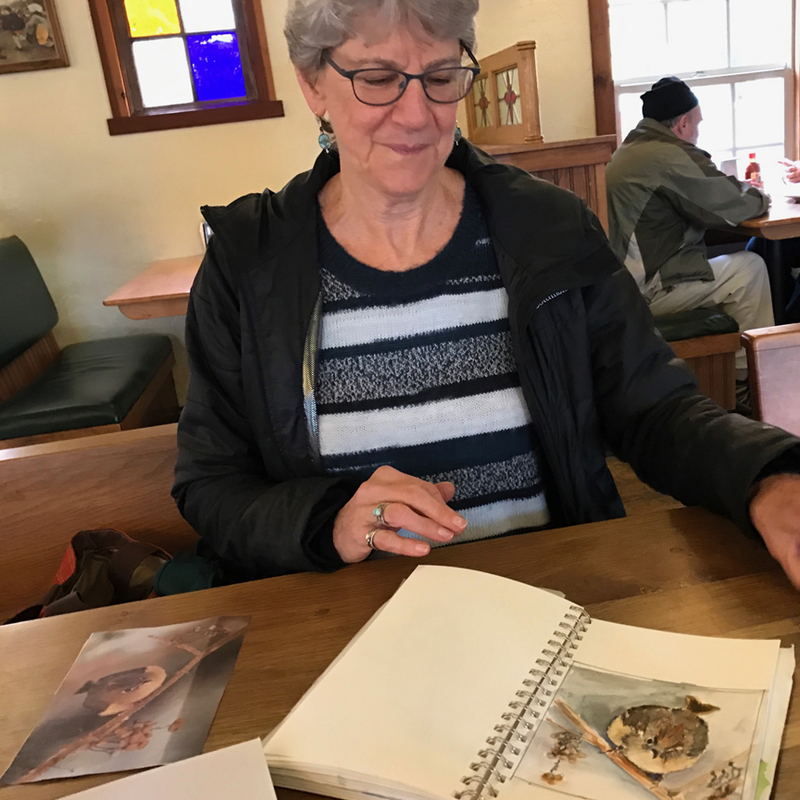 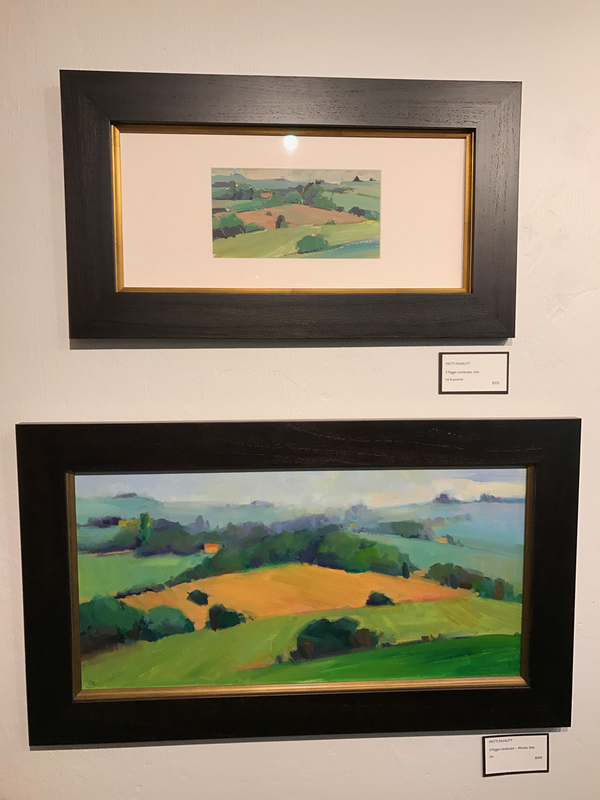 It was a special treat to have Patti McNutt display her gouache & ink sketch from Italy along with her follow up oil done back at home. 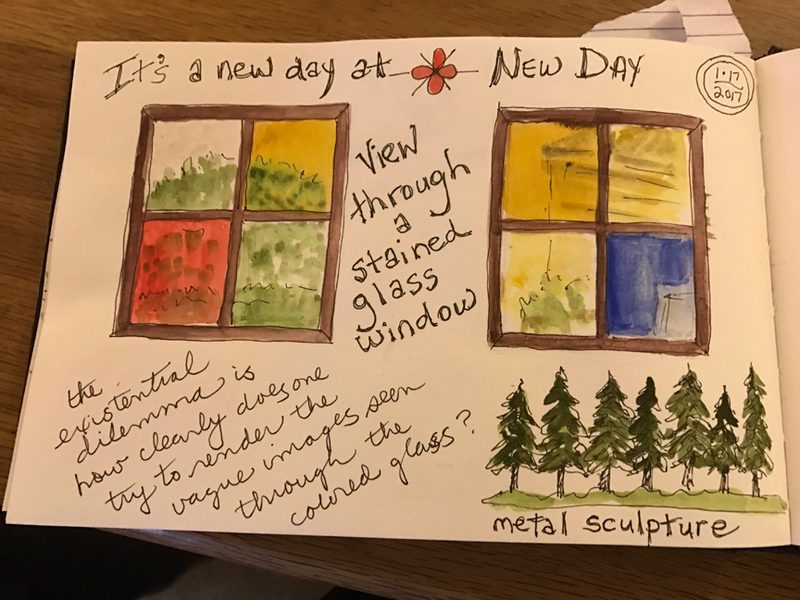 Cheryl & Robert take a closer look at Jane’s selection of daily sketches. 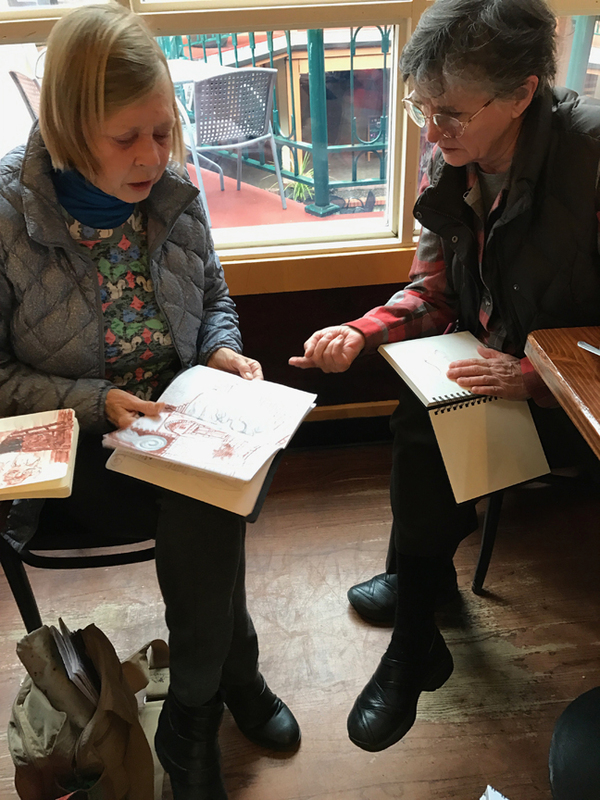 Satoko and Tricia chat in front of Sandy’s & Ken’s sketches. 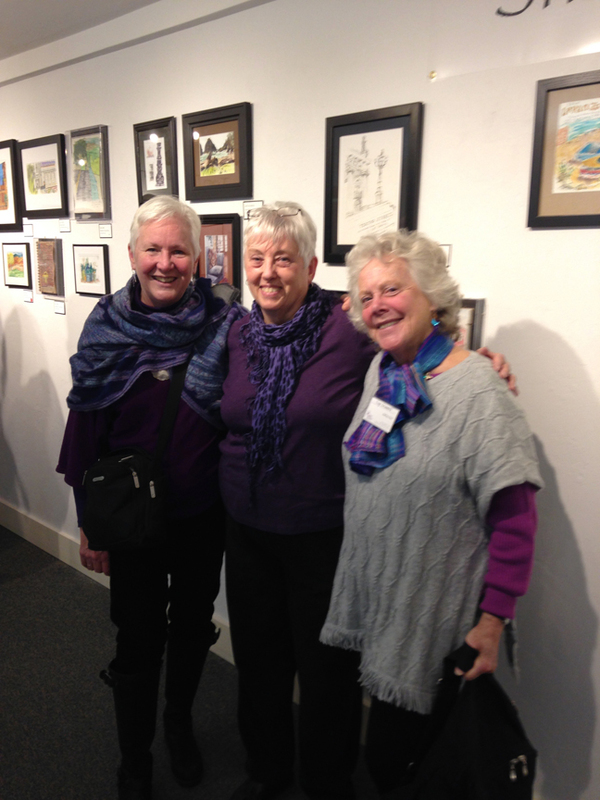 No wonder sketchers Phyllis, Jane, & Barb A were so happy! 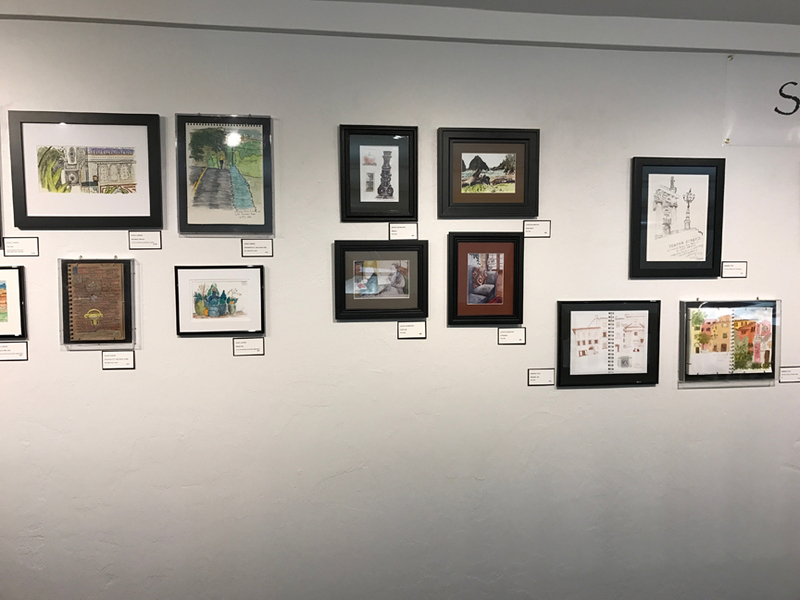 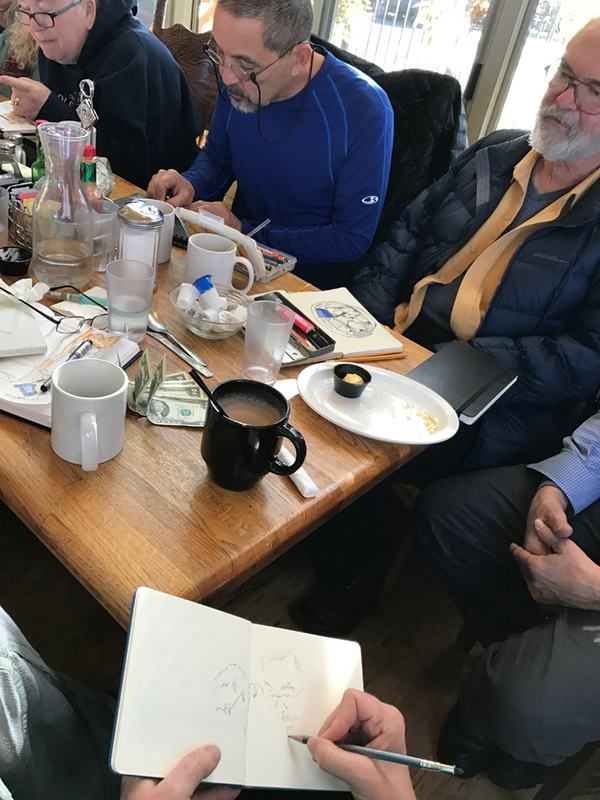 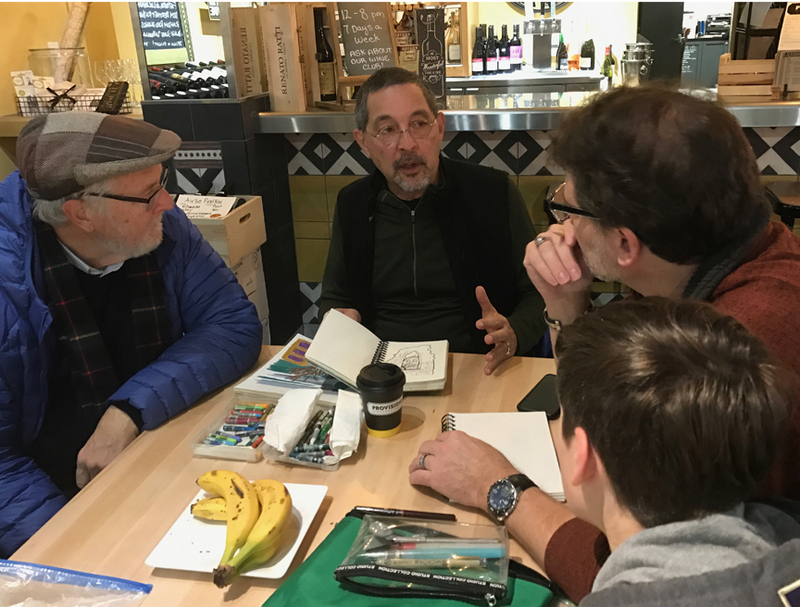 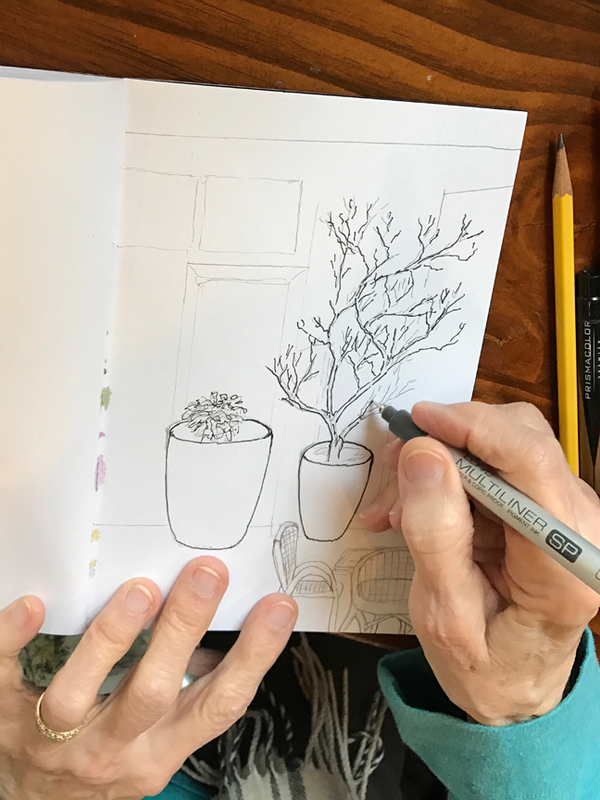 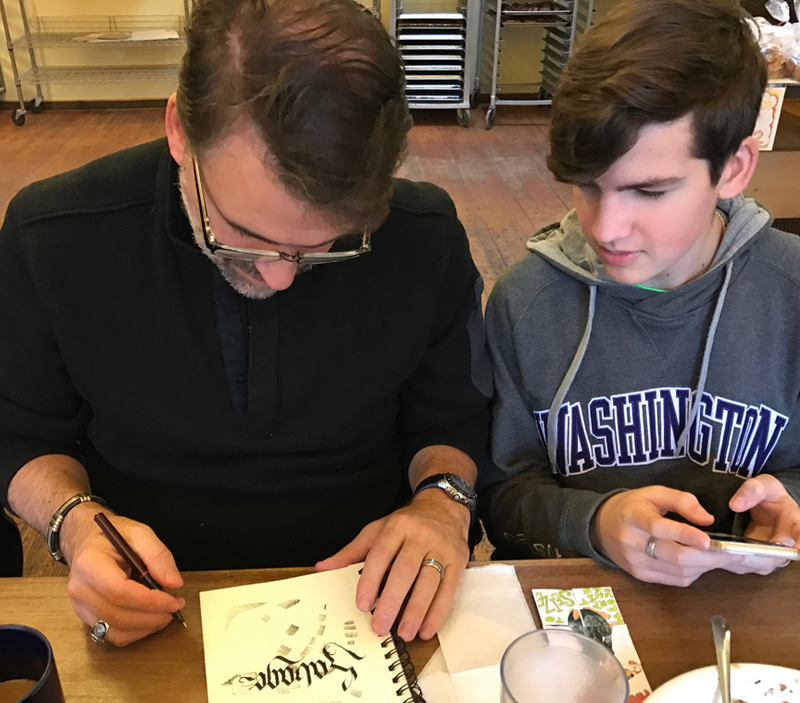 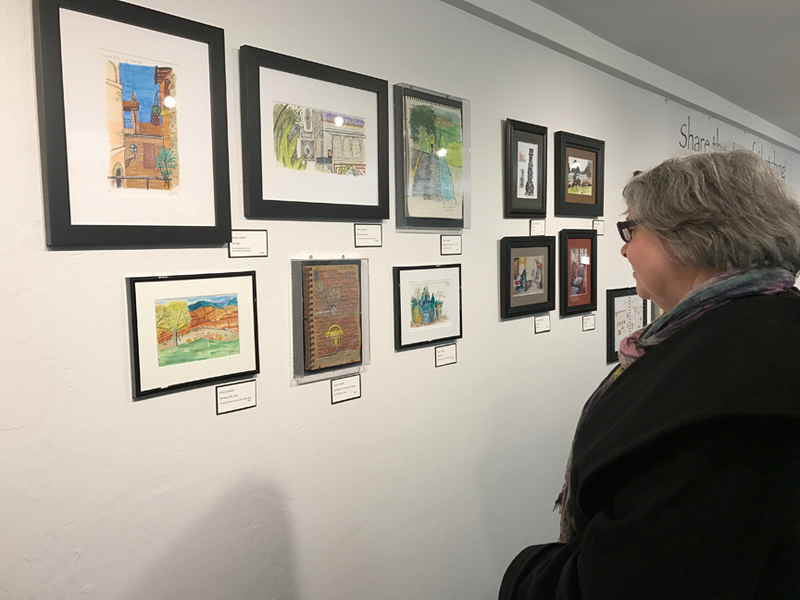 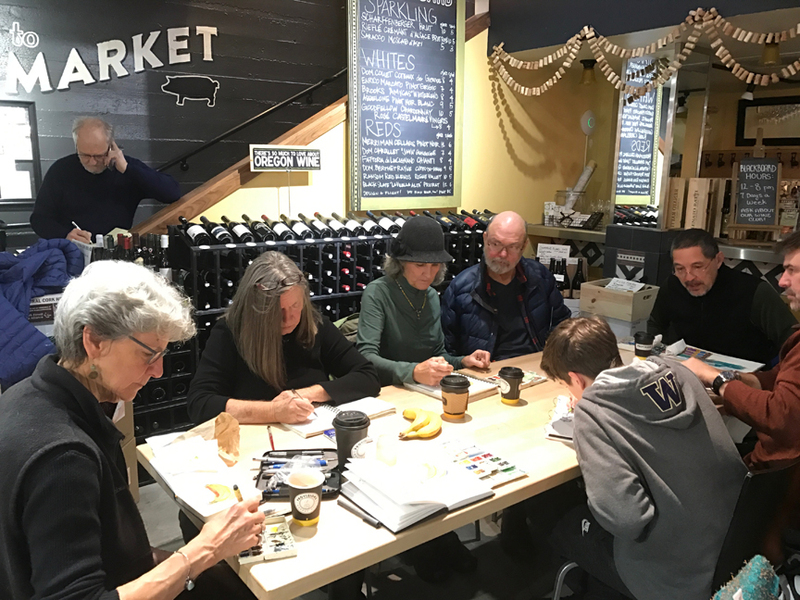 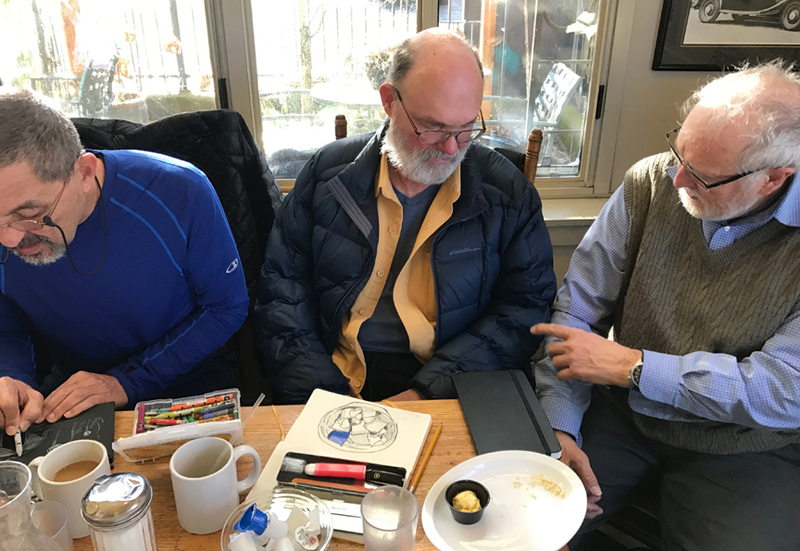 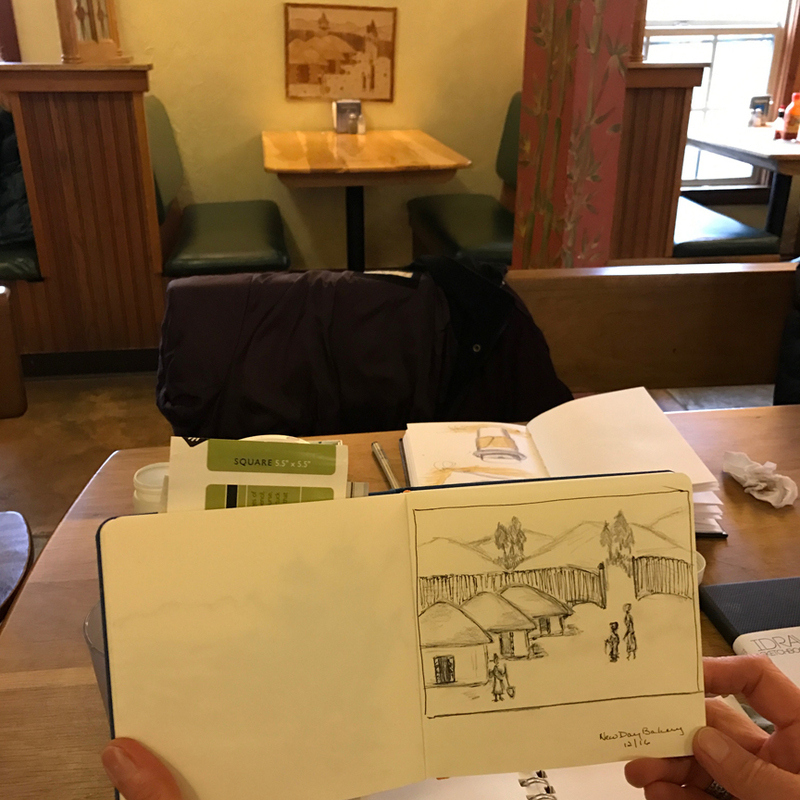 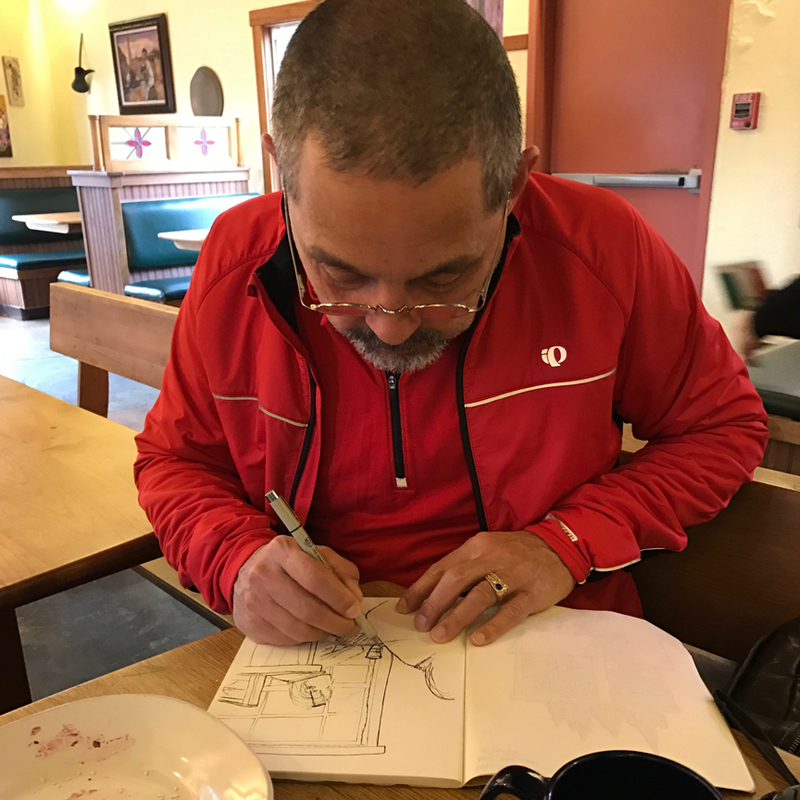 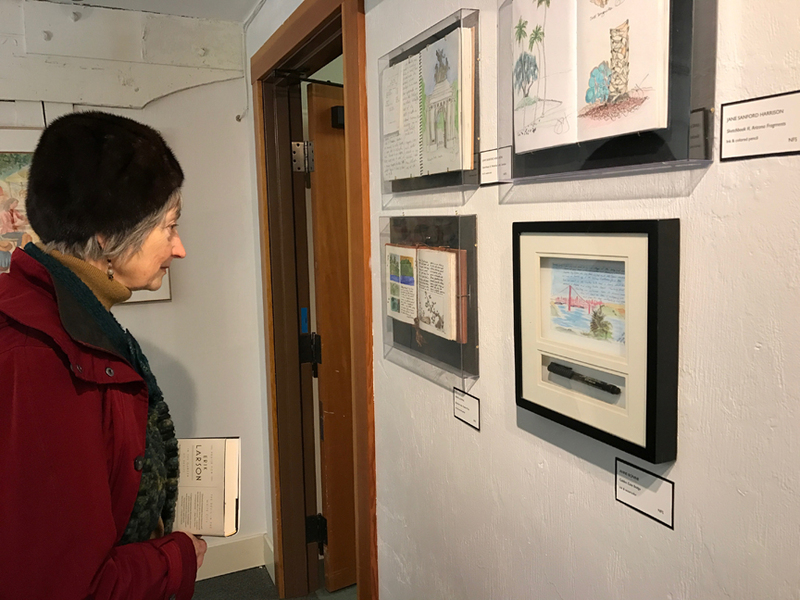 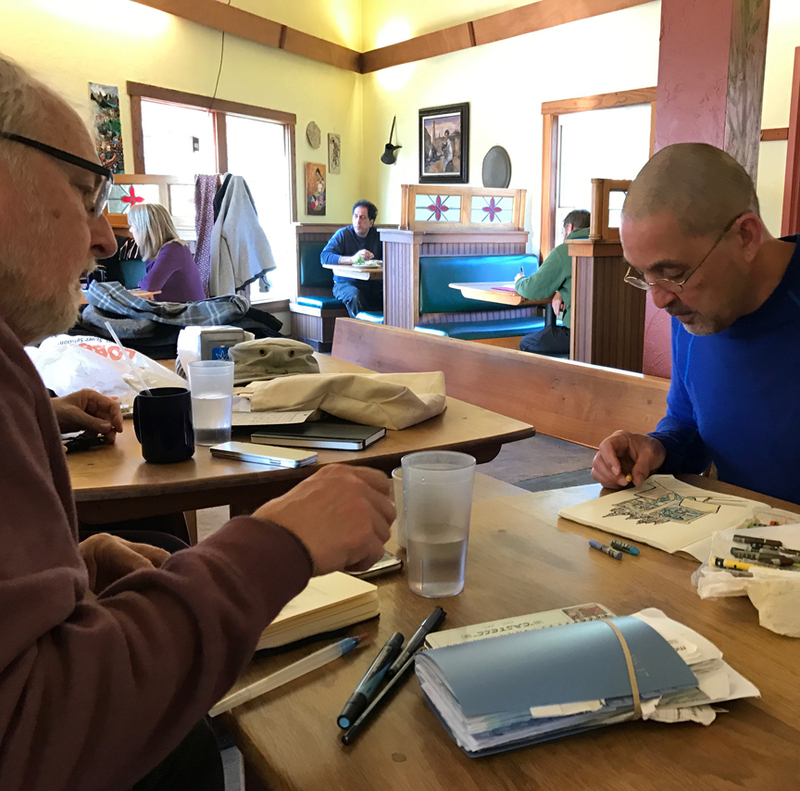 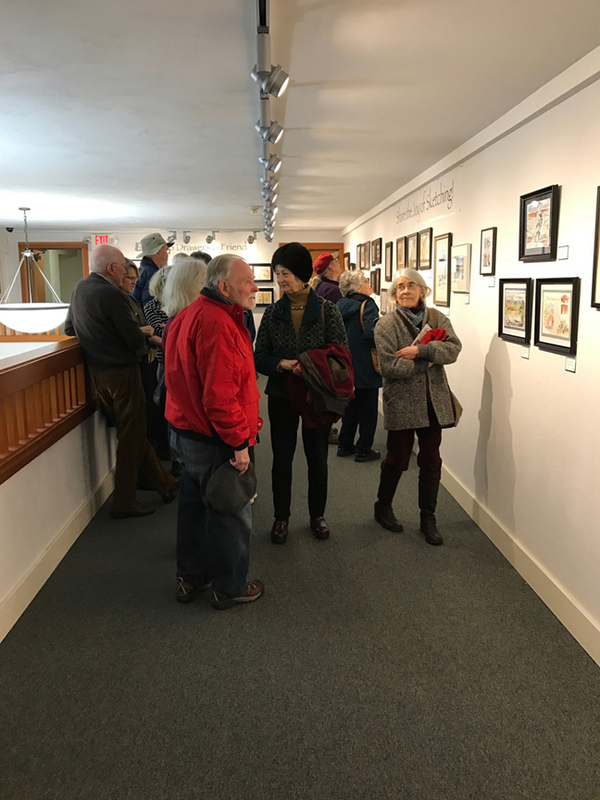 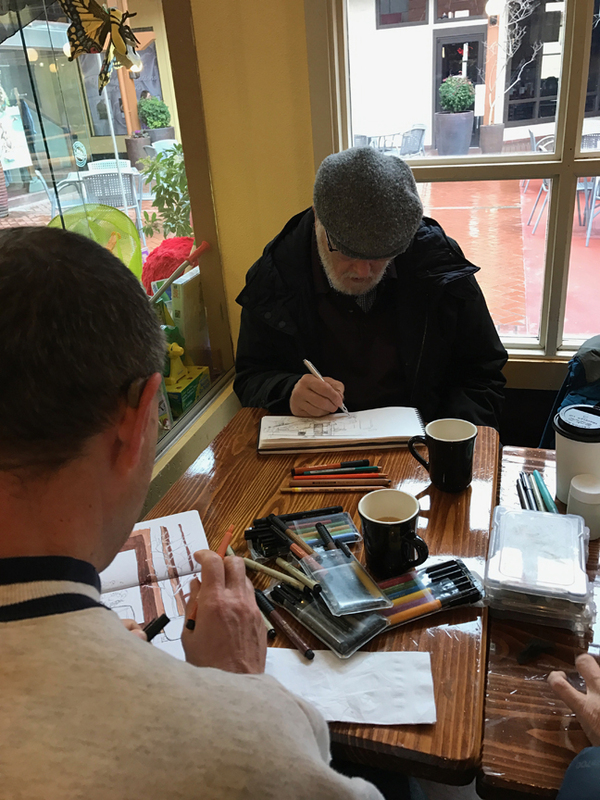 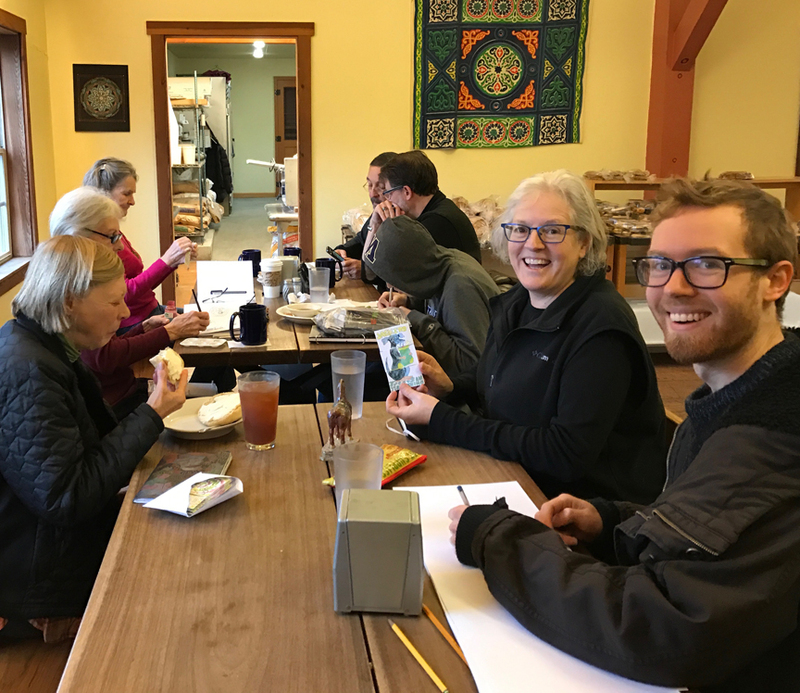 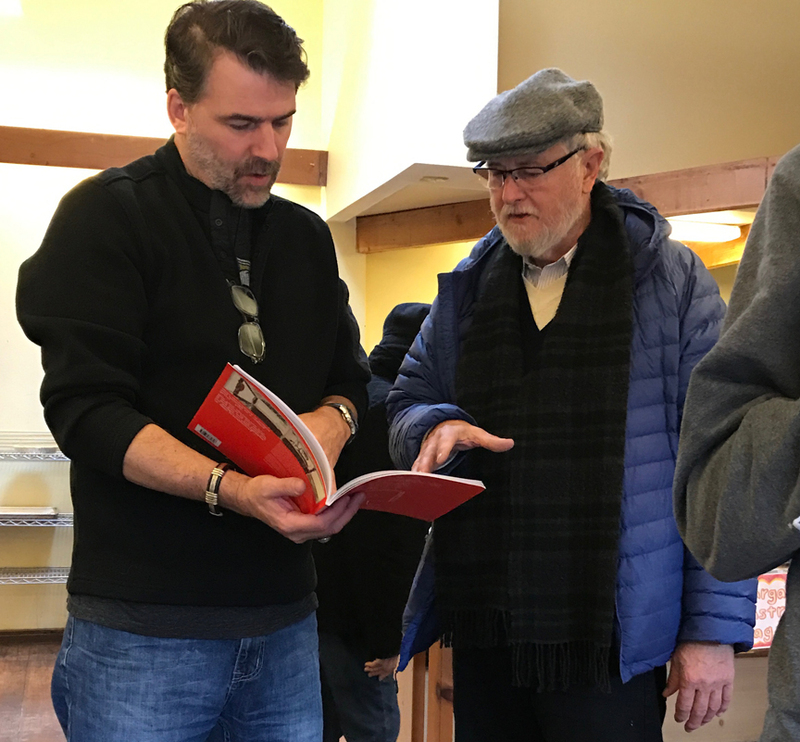 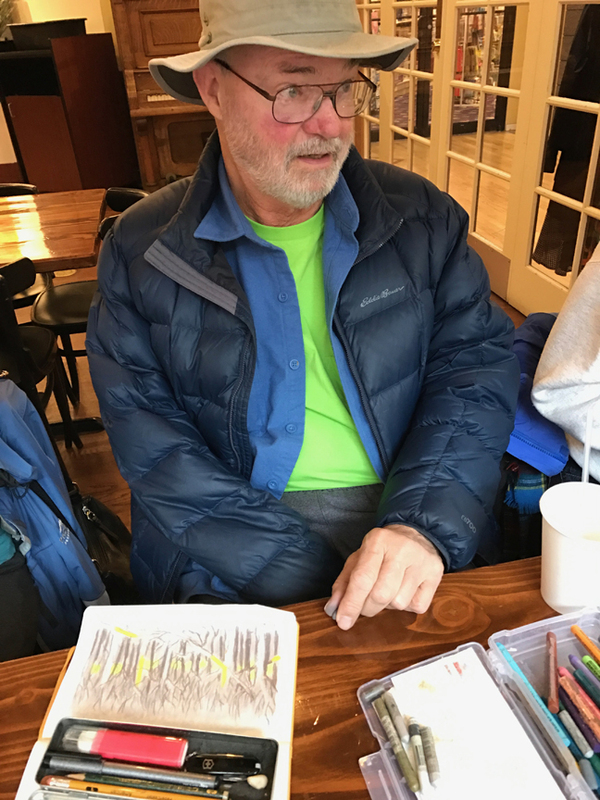 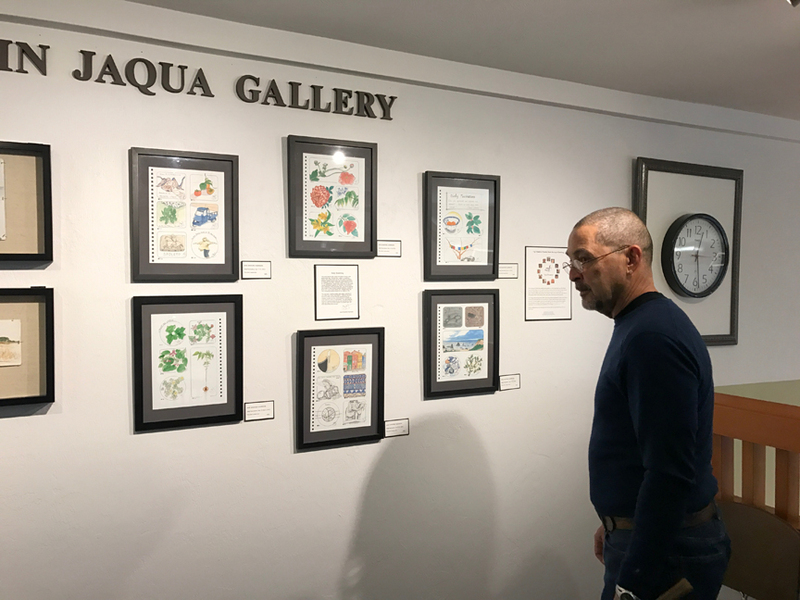 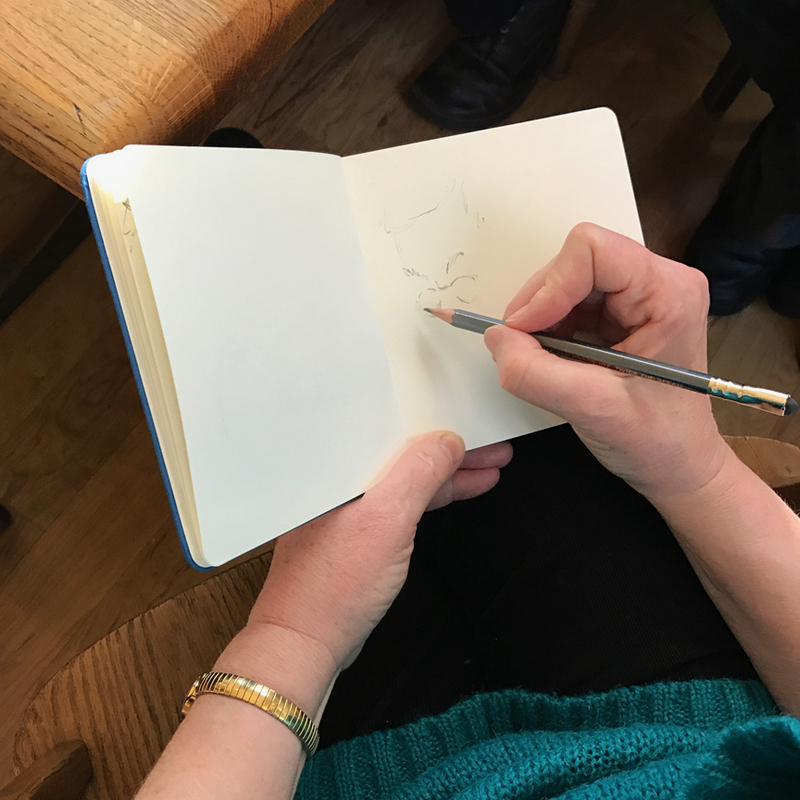 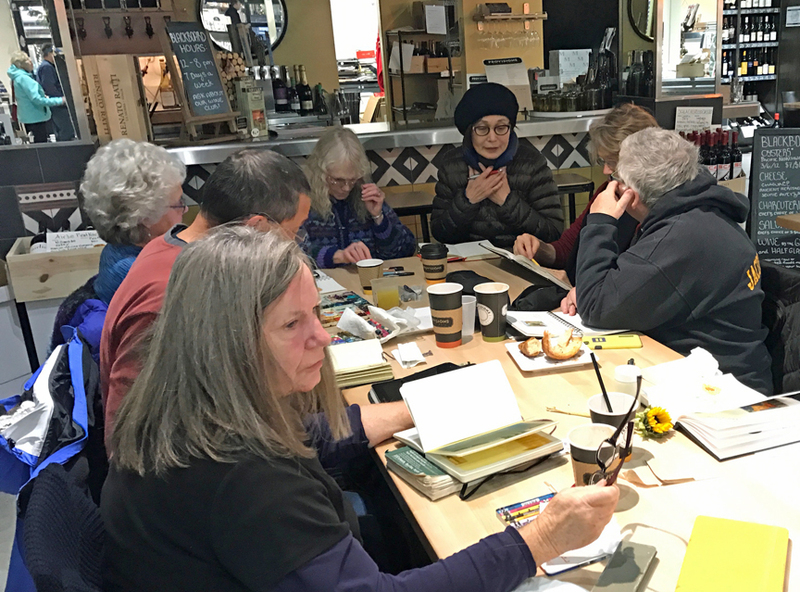 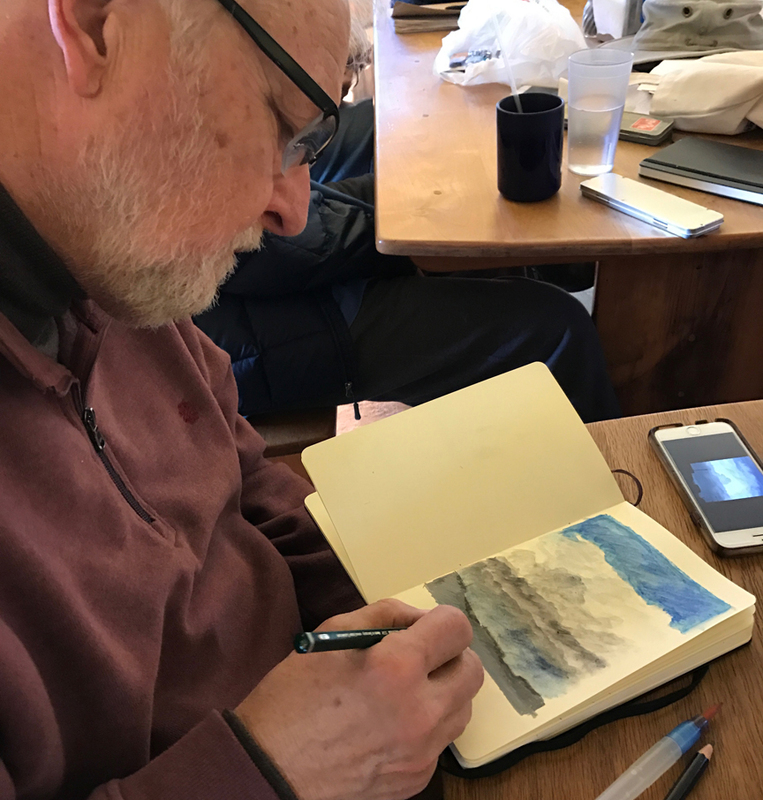 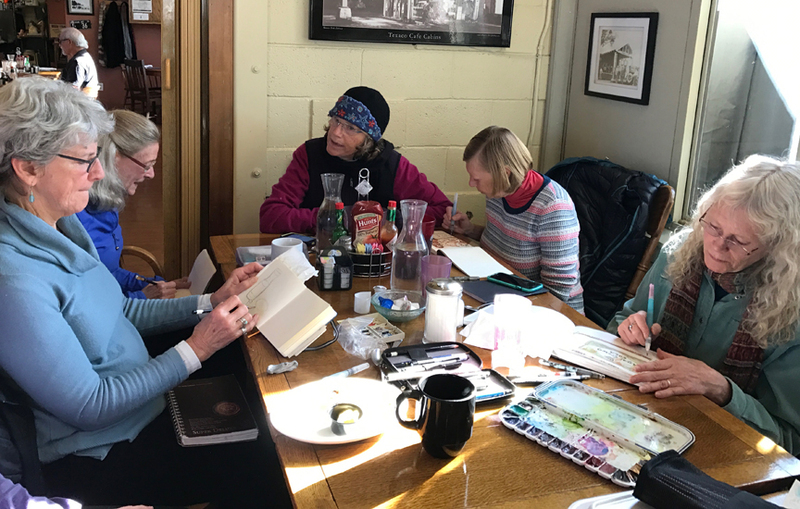 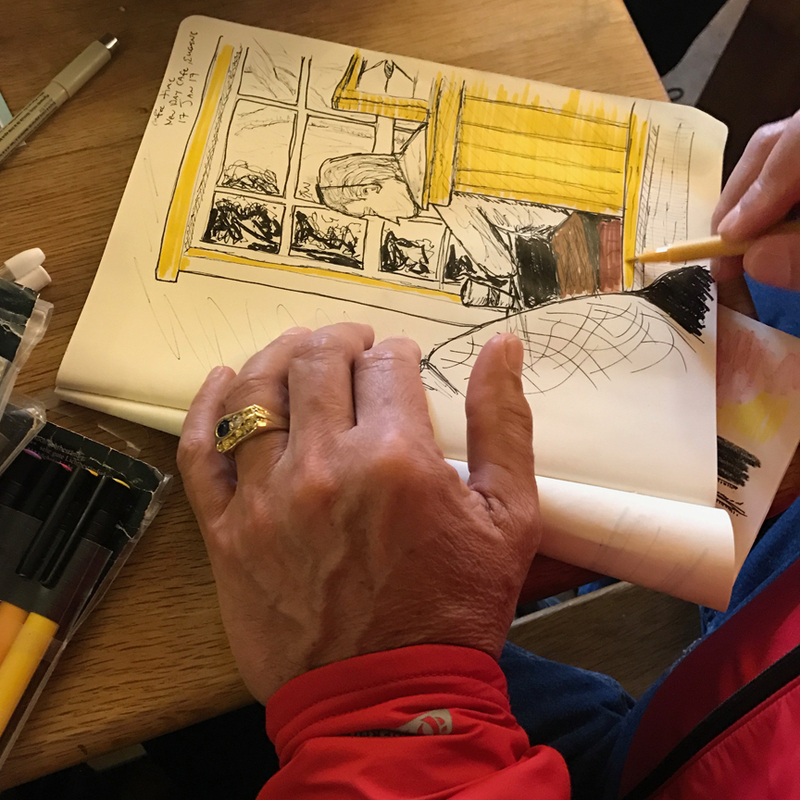 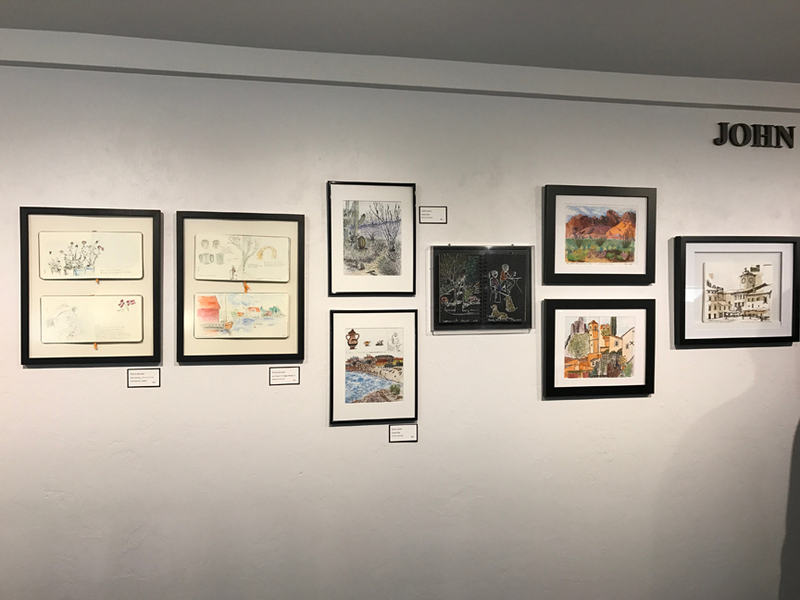 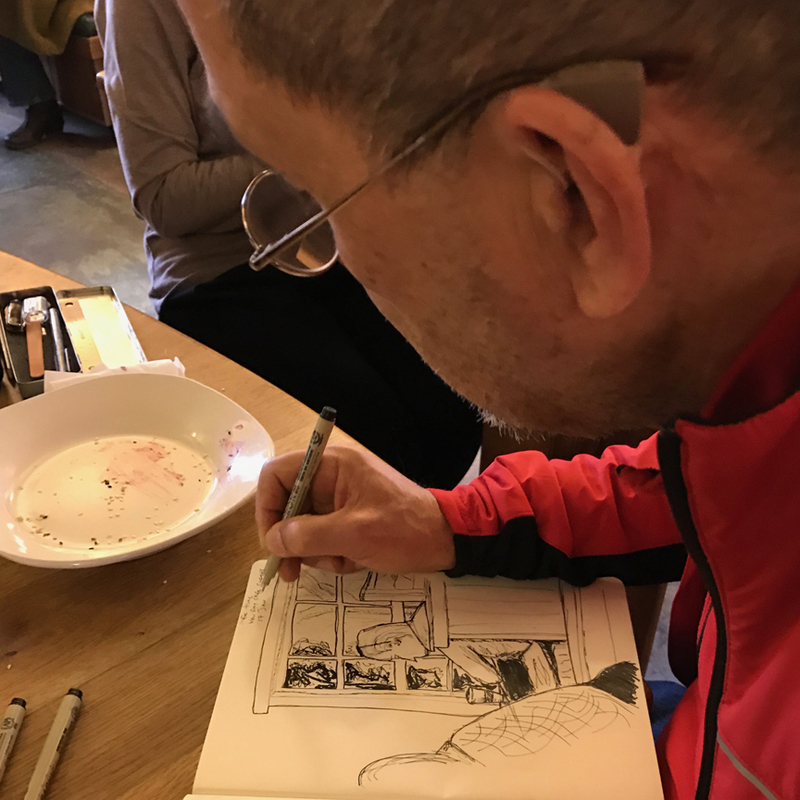 We were invited to hang a show of our work to help others visualize the joy of sketching, and the group didn’t hesitate to pull it together despite weather woes. 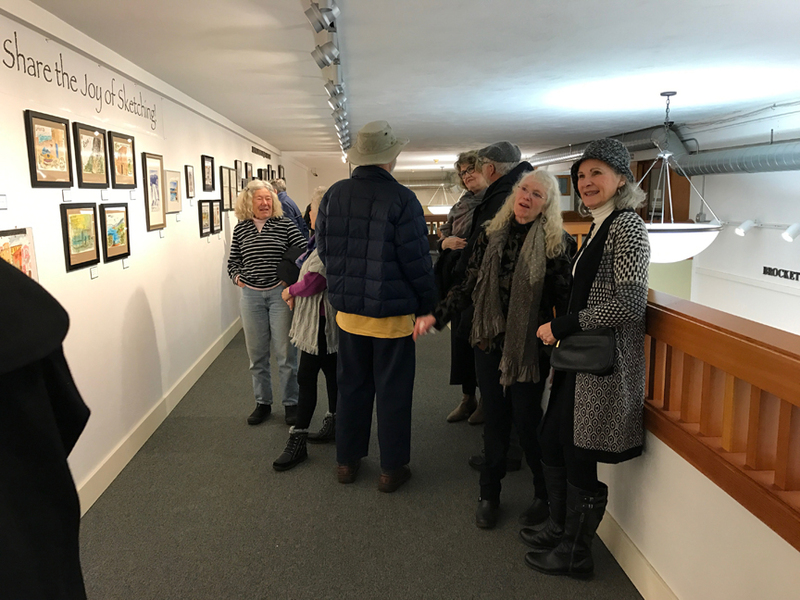 The show will be up Jan. 10- Feb. 4, but our opening reception is Friday, Jan. 13, 7:30-8:30 – join us! 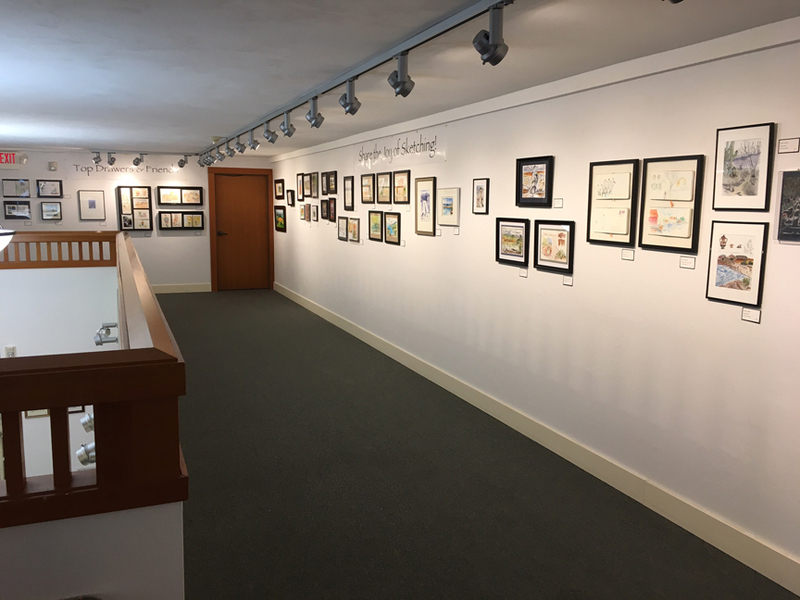 Here’s an overview shot of how the show appears in the upper gallery at the Emerald Art Center. 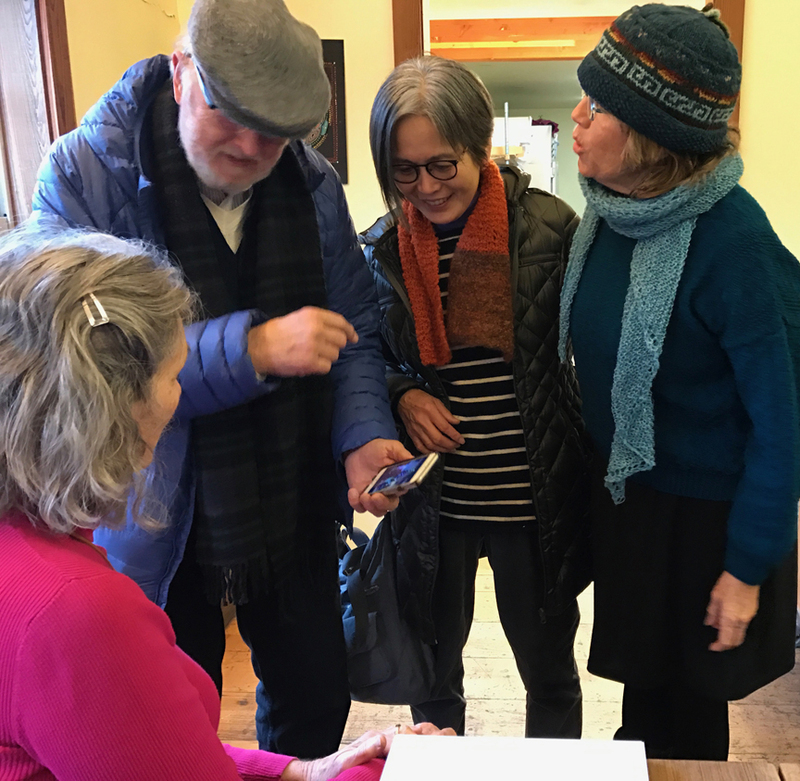 Phyllis Helland, Sandy Larkin, Ken O’Connell, Jane Harrison. 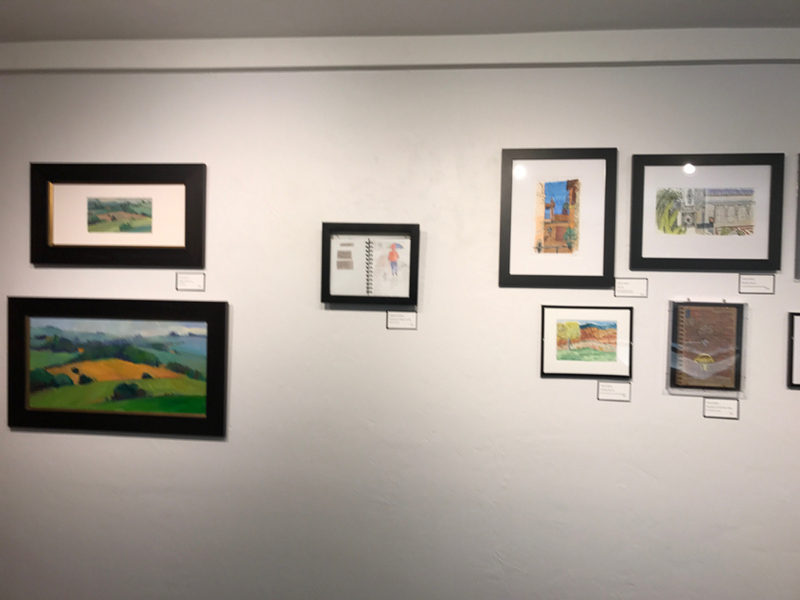 Also included in the show but not pictured here is Penny McAvoy. 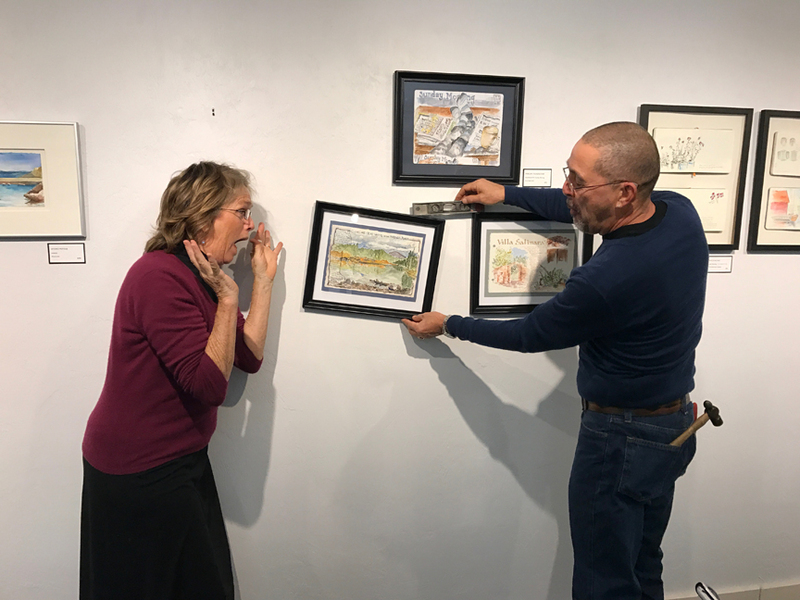 Penelope gives some feedback to Hugh, our master hanger, on how level the pieces are, then Hugh steps back to admire the show. 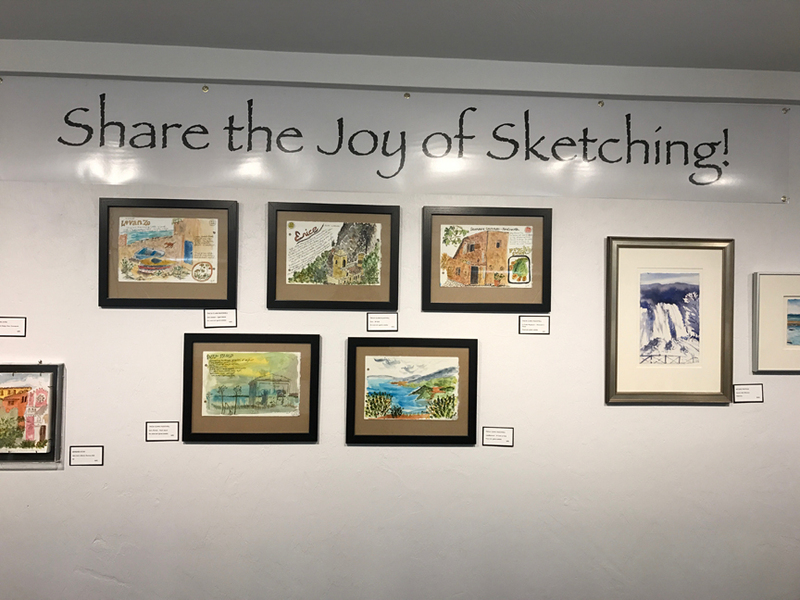 Happy sketch hangers: Sandy Larkin, Penelope Youngfeather, Hugh Larkin, Barb Sommers, Jan Brown. 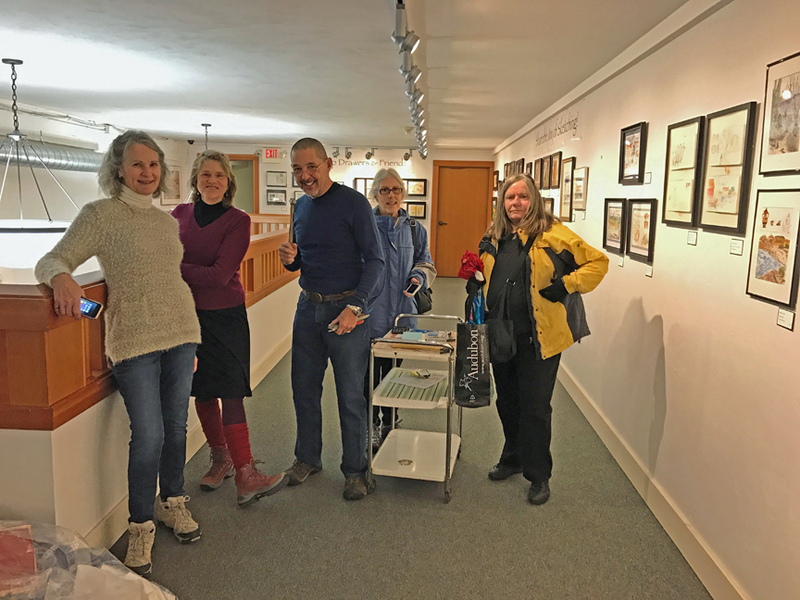 Not shown here but helping out with the labeling, glass cleaning, frame straightening and general enthusiam were Ken O’Connell, Penny McAvoy, & Jane Harrison. 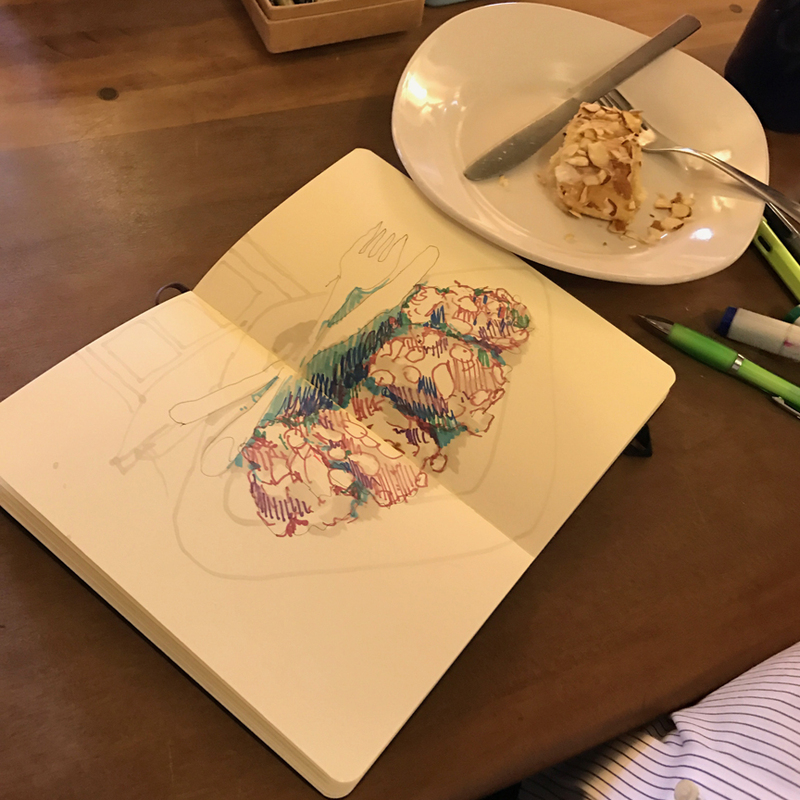 We Always Keep On Sketching!